The week after the Bataan Memorial Death March, I was slated to run and sing at two races - the Two Rivers Half in Lackawaxen, Pennsylvania (which I did last year) and the All-American Marathon in Fayetteville, North Carolina. 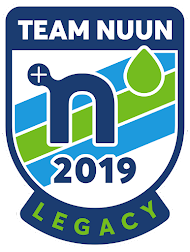 But I was so sick in the week following the race, and my knee started to give me issues much like when I was sidelined during November 2016 with quadriceps tendinitis, that I made the very tough decision to not go to both races and take a DNS. I contacted race directors for both and very regretfully had to tell them my unfortunate news. Luckily for both races, I was given complimentary entries for doing the anthem. Additionally, I had not booked any accommodations for Pennsylvania as the race director was going to house me, and it was a fairly easy NJ Transit ride out to Port Jervis for the race; accommodations in North Carolina were taken care of by my friend Cozette, but she ended up injuring herself too, and was able to cancel the hotel reservation she had made. I just had to figure out a way to cancel my flight and hopefully get refunded. Luckily, due to my sickness, I was able to get the flights credited to my account. I was able to get out of the weekend without having to lose any money at all. The following week was trying, because despite getting better from my sickness and my knee pain pretty much going away, I started to develop a pain in my left foot, like when I've gotten gout attacks in the past. 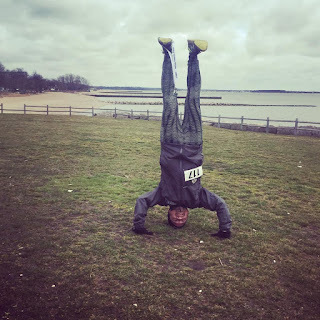 This pain persisted throughout the week, and I was not so sure I would be able to run the race I had scheduled the week after: the Savin Rock Marathon in West Haven, Connecticut. My friend Seth was flying in from Fort Lauderdale late on Friday night to run the Saturday morning race, and our plan was for him to get a rental car, which he'd park near my apartment, and he'd sleep a few hours after arriving before we were out on the road by 5:30am to get to West Haven by 7. Seth got in pretty late after some flight delays that annoyingly plagued the New York region the entire day, and we didn't get to bed until around 2am, so that meant about three hours of sleep. It had basically rained the entire day, and the weather was affecting flights coming into the area. Luckily, I had napped a few hours Friday night before he buzzed up to my apartment. We got up at 5am, and I still hadn't fully decided I was going to run. Nevertheless, I got dressed, and we were out on the road headed up to Washington Heights to pick up Seth's friend Tibby, who was also wavering about doing the race. We got to West Haven a little after 7, and boy was it cold. The weather reports had said it was going to stay in the 30s all morning with a less than 40% chance of rain (after raining all night the night before), but the wind was going to be a factor to make it feel much colder. Being right on Long Island Sound, the wind was going to blow in excess of 15 mph, sometimes with gusts in the 20s. My foot was starting to feel better, and I downed a couple Aleve just in case, so I decided that yes, I was going to run. Tibby didn't feel well during the ride up, so she decided to sit this race out. 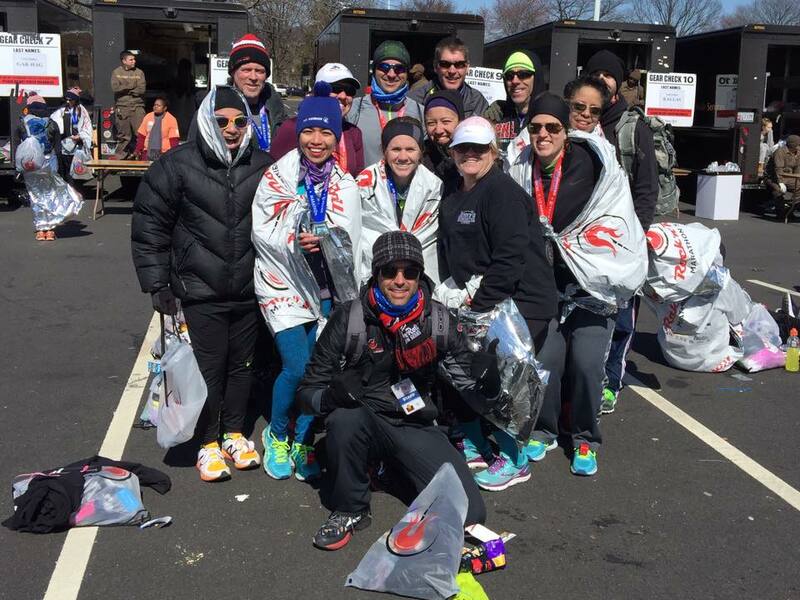 The course was 13.1 miles, so marathoners would have to do two loops. 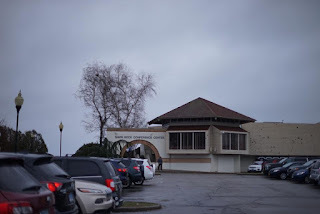 After sitting inside the Savin Rock Conference Center to stay warm, we headed out into the frigid Connecticut air, and assembled along the unassuming sidewalk that overlooked the sound behind the conference center. I found Clint, the race director with local running club the Shoreline Sharks, and we arranged for me to sing the national anthem through the megaphone right after he made some announcements. 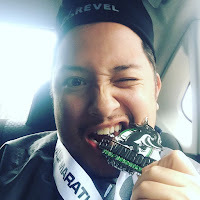 In the announcements, he had mentioned that runners who were signed up for the marathon who didn't feel like doing the second loop could end after the first 13.1 miles and notify the timekeepers that they were downgrading to the half marathon, so I kept that in the back of my mind. He also mentioned that there were only two locations for port-a-potties in the entire route: at the conference center where we were at that moment, and at the halfway point 6.5 miles into the loop. He finished his announcements and for the first time ever, I did a rendition of the Star Spangled Banner using a handheld megaphone. I rushed it a bit since it was pretty cold, and we all needed to get moving to get our bodies warm again... Seconds after I finished, I gave the megaphone back to Clint, and he made the alarm go on the megaphone to signal the start of the race. I rushed to get my Garmin started, and then I was on my way! The start was cold and windy - 36° with a 19 mph wind making it feel like 25°, and while it didn't full on rain, it was light enough to collect on the light Lincoln Marathon jacket I decided to wear for the race. 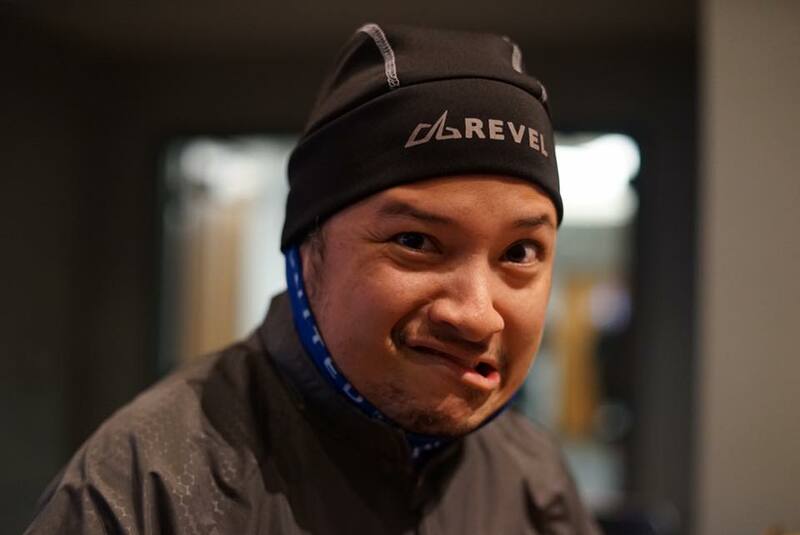 I had anticipated the cold weather, so I wore two layers of dri-fit shirts (one long sleeve, one short sleeve) underneath the jacket, plus a pair of long tights. We made our way northeastward along the Savin Rock Trail past a bunch of waterfront apartments, and then came off of the trail onto the aptly named Beach Street, which we continued to follow in a northeastern direction alongside the Sound. 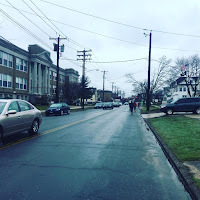 I ran a rather quick (for me) 9:18 first mile, as we curved in a northern direction, past Morse Park, and then we were directed by a West Haven police officer to make a slight left turn onto 2nd Avenue rather than continue alongside the water. After the race, I was told the police officer who was at this turn didn't stick around for the marathon runners coming around for the second loop, so there were a few folks who ended up running extra miles, including some of the race leaders! 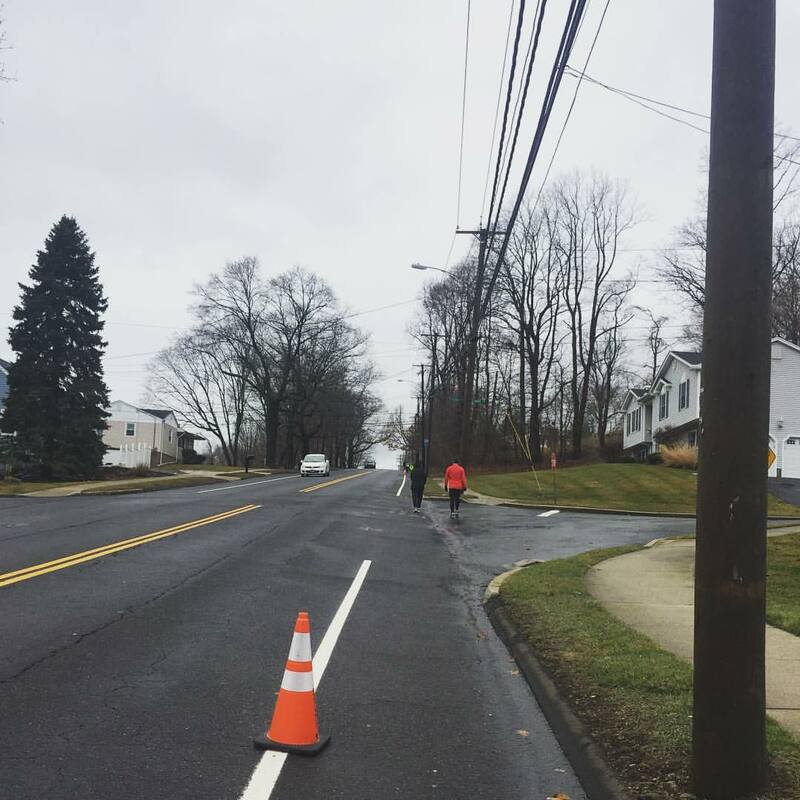 After a short downhill, we turned left into a neighborhood street and ran along Painter Drive before reaching the mile 5 mark, and then turned left onto a busy Main Street, backed up with cars waiting for a break in our continuous flow of runners. We headed west along the rolling Main Street, as we dodged puddling on the side of the road from the previous night's storms. Over these first six miles, I would play a bit of leapfrog with this guy and his dog, a giant schnauzer named "Hazzard," who would end up running the entire 13.1 mile loop. The dog seemed to be having a blast; while unleashed, he'd run ahead and then inspect the grassy areas on the side of the road, or in this case the ankle deep puddles. 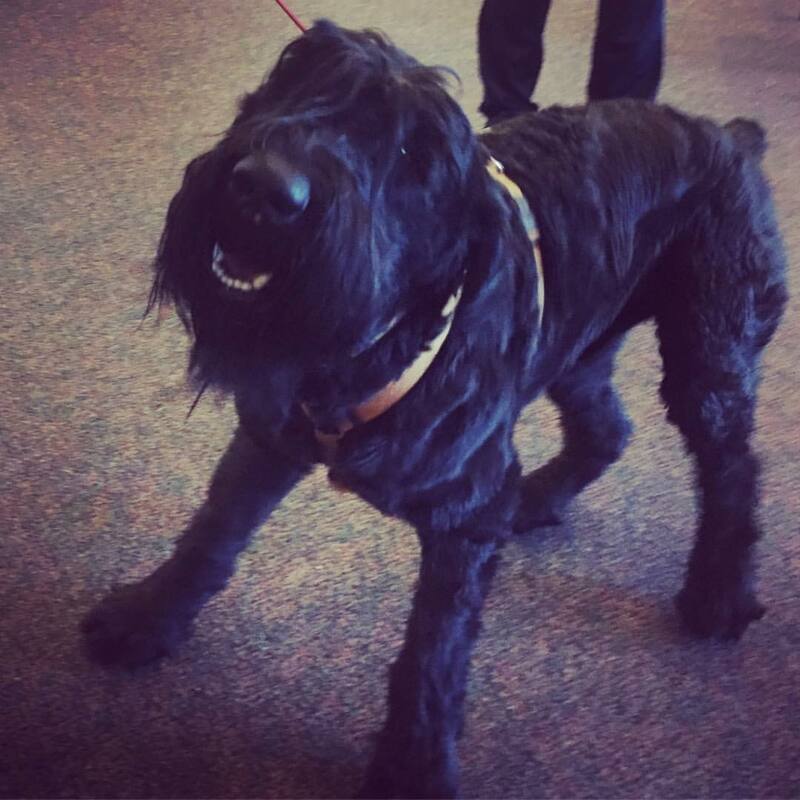 The dog would also go about doing his business wherever he pleased, which made me quite envious, since I was in dire need of a port-a-potty! Is that the Stanley Cup? 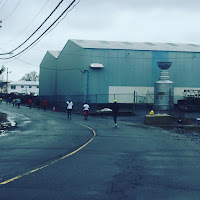 We made a slight right turn onto Allings Crossing Road, and then finally made it up to Island Lane, in a fairly industrial looking part of West Haven. As I hurriedly looked for the damn port-a-potty, we continued westward. 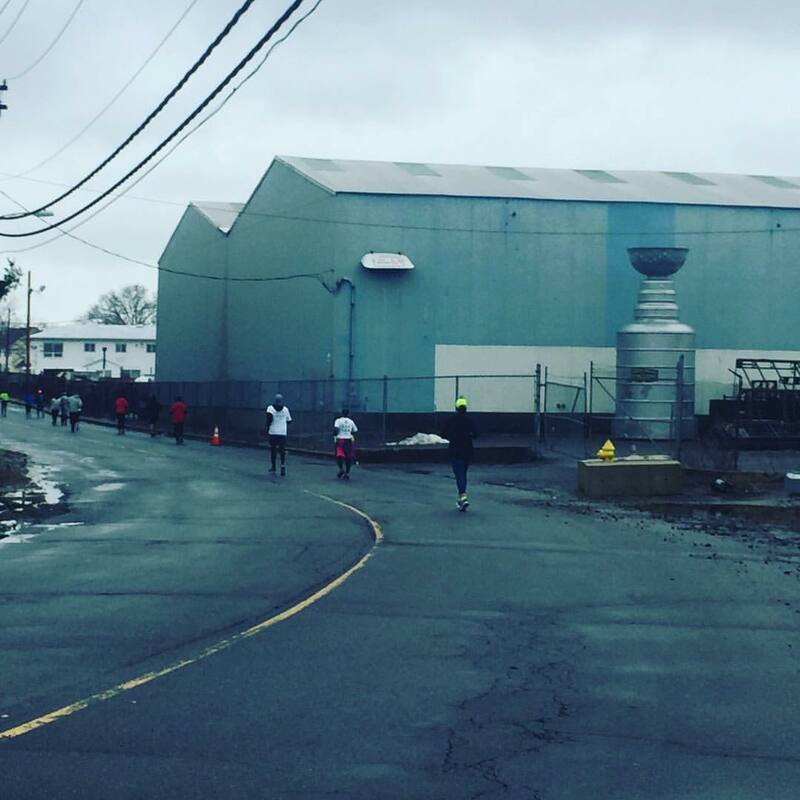 We passed a large replica of the Stanley Cup behind an oil heating warehouse building, and then finally there it was. The port-a-potty. Already forming a small line, I was third as I waited and ended up tacking an extra five minutes onto my time before even crossing the timing mat that lay ahead. But at this point, I really didn't care - I just needed to use that damn port-a-potty. Finally, I was able to use it, and then get back onto the road, a little worse for the wear, but at least my stomach was slightly appeased. We continued along Island Lane for another 1/2 mile, as I came upon my friend Carol from Arkansas, who I had last seen in Portland for the Foot Traffic Flat back in July of last year. 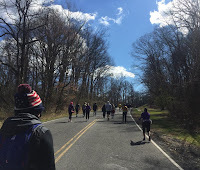 After a little small talk, I continued on, as we turned left onto Benham Hill Road, tackling some more rolling hills and running past a middle school. We continued on along Shingle Hill Road, where we were able to experience our first real nice downhill of the race, dropping from about 173 feet in elevation to 44 feet over about a 1/2 mile. We turned a corner onto Jones Hill Road, and hugged the shoulder of road while beginning a climb for another 1/2 mile that took us to 150 feet. 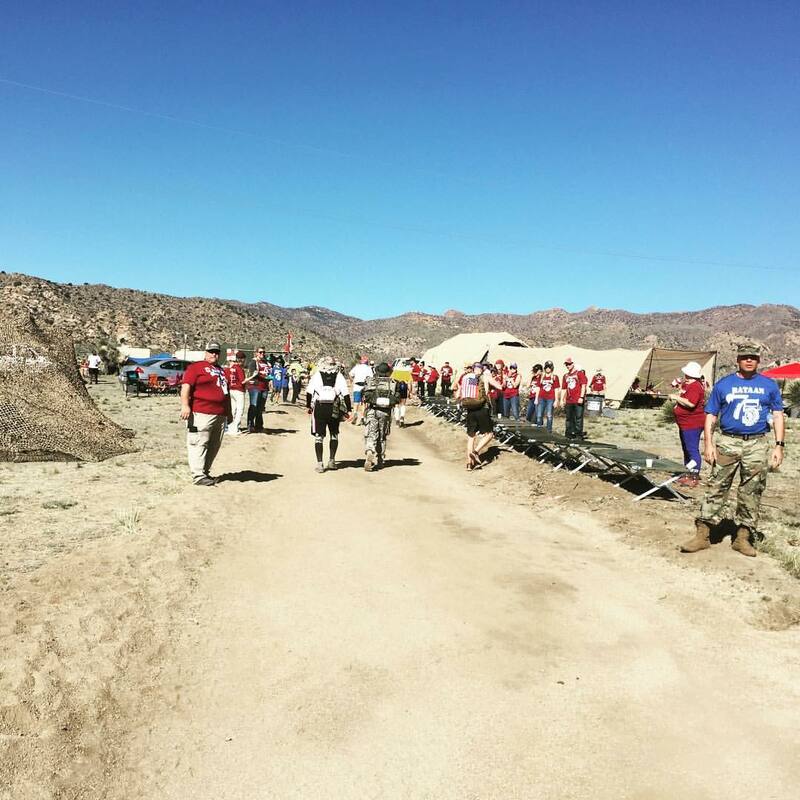 Needless to say, this was the hardest part of the race, at just under 9 miles in. 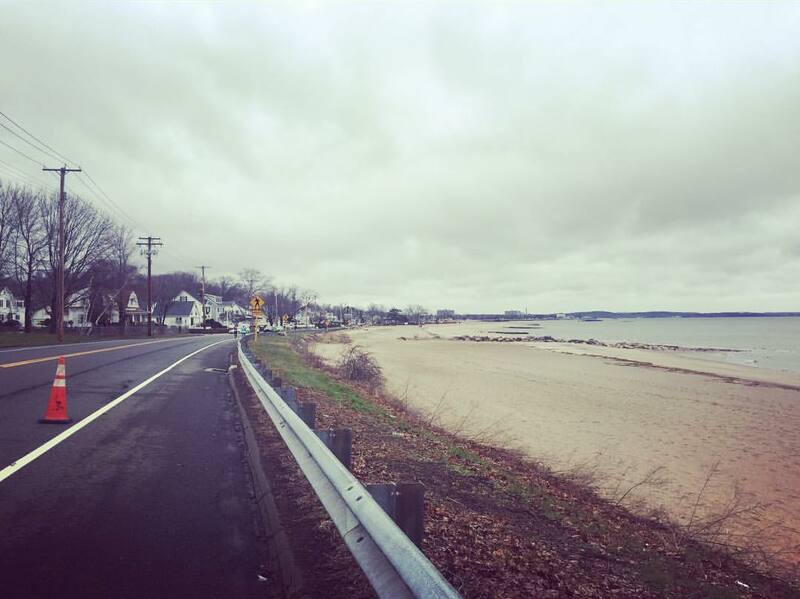 Long Island Sound, near the start/finish. This was also at around the time where I decided that I was not going to continue past the first loop, and would take a half marathon time. My stomach was still in knots, and the cold was definitely bothering me; the wind wasn't a problem at this point in time, but it would be later when we got closer to the water. I struggled on as we rolled down Jones Hill Road for the next 1.5 miles, making our way down to a roundabout where our second to last aid stop was. We'd then follow Ocean Avenue all the way back to the finish, getting the hugest gusts of wind as the waterfront homes gave way to open beach. I seriously was not enthused about doing a second loop, so I was glad I was finishing up by the 13.1 mile mark. I had some seriously slow miles as I trudged along Ocean Avenue, finally turning into the Savin Rock Trail at Bradley Point Park, past a Veterans Memorial and then to a little jut out into the sound, before clearly being done with this race as I struggled up the hill to the finish line and told the timekeepers I wasn't continuing on. In fact, I was so distracted, I neglected to turn my watch time off, and ended up tacking an extra five minutes of walking in and around the conference center onto my GPS data. stomach made me downgrade to the half. 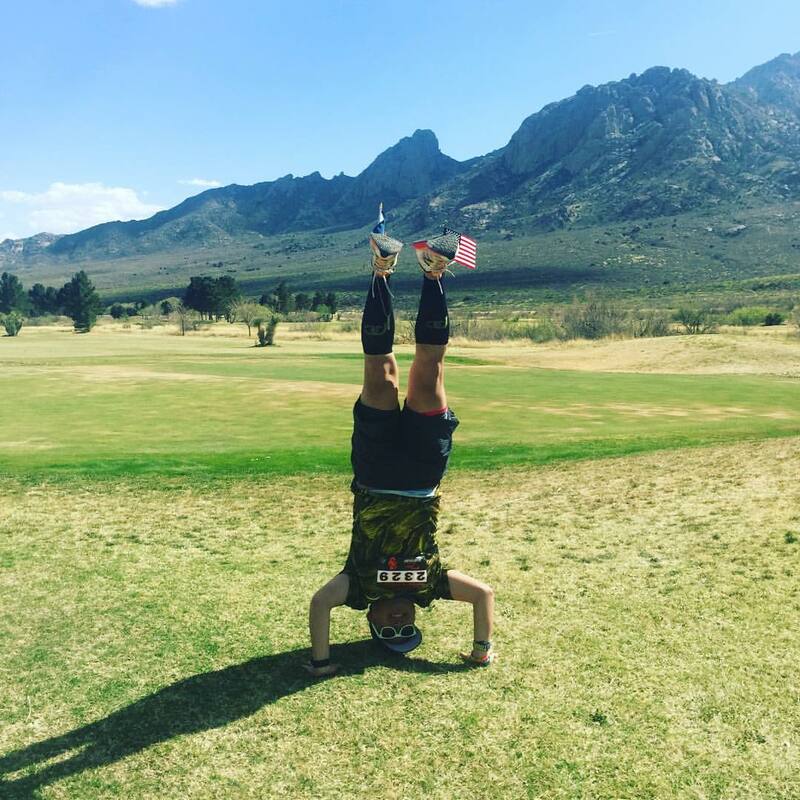 A tough course but a Victory Headstand nonetheless! It was a super slow time for me - 2:44:44. But I knew I was going to have a rough go at it with all the factors that contributed to this race for me. 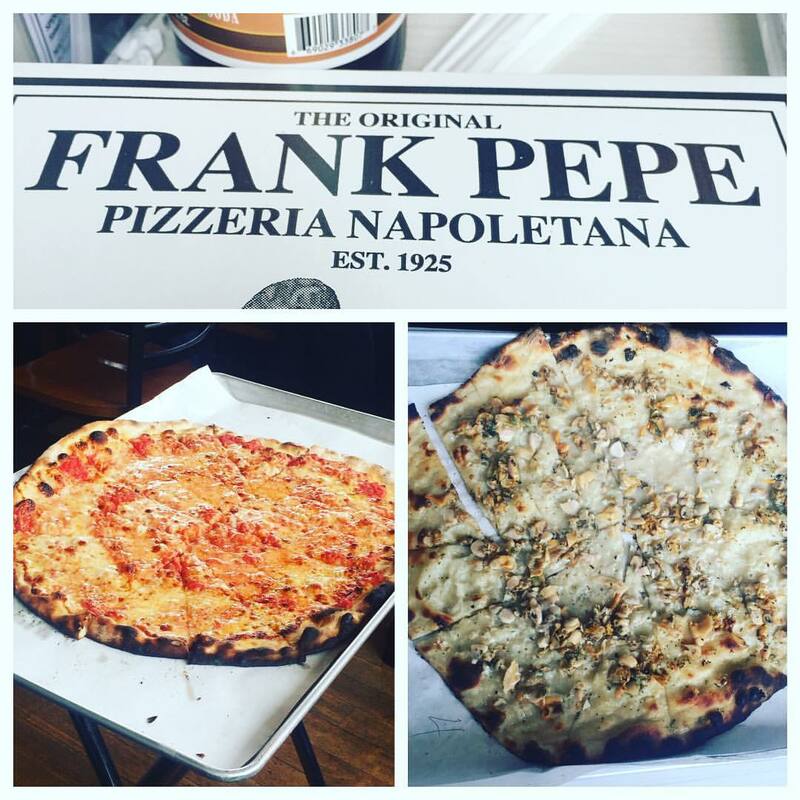 I settled into the warmth of the indoors and made sure my stomach was getting itself back to normal. 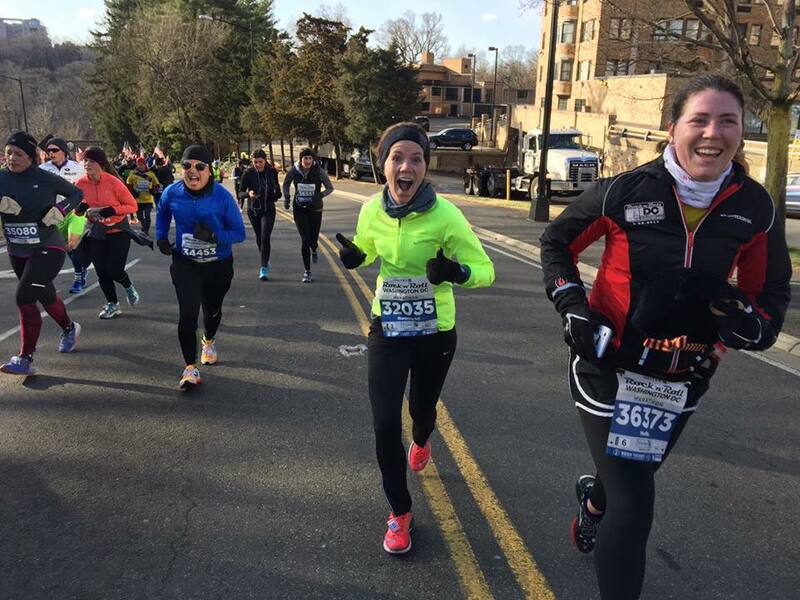 At the four hour mark, I braved the cold of the outdoors again, and found my friend Nora coming into her finish, and then came back outside again to witness Seth finish a bit later. 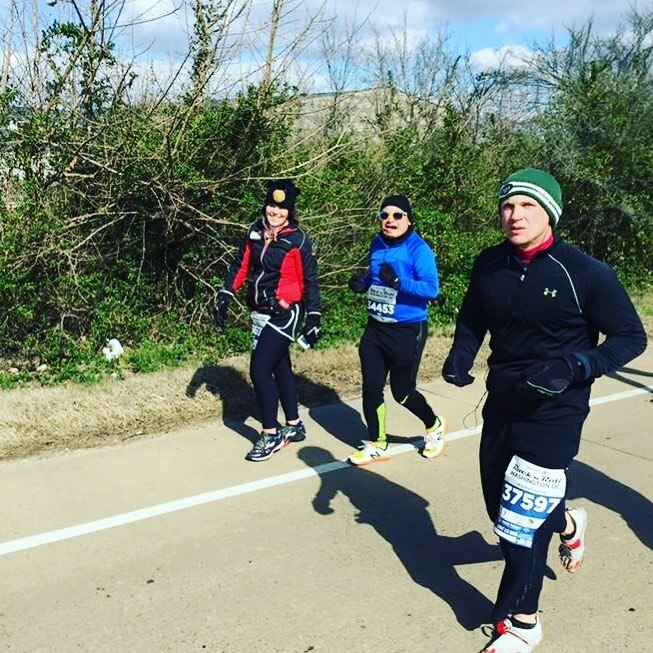 This was a rough race for both of us, but at least he got a full marathon in. Alas, I'll have to come back to Connecticut, but at least my commute here is a bit easier. 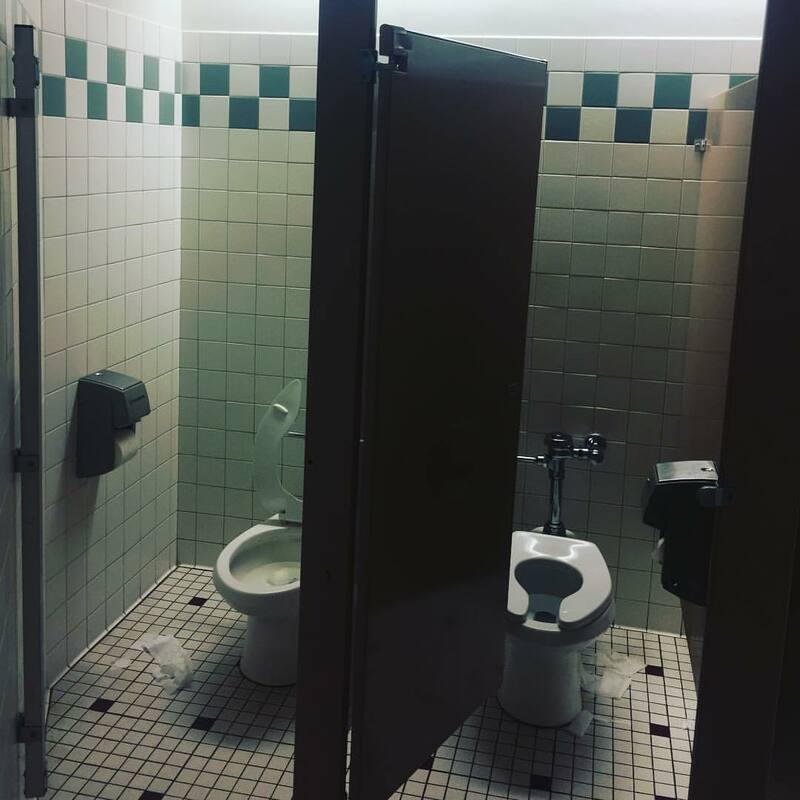 The men's bathroom. Only one of these stalls has a door. 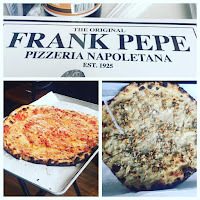 We made it back to New York by around 5pm via what I think was the Whitestone Bridge (I have no idea, I had fallen asleep on the way home), and we dropped off most of our car passengers at Queensboro Plaza before Seth and I headed back to Jackson Heights and my apartment for much needed showers. His flight back to Florida wasn't til 8pm, so we at least had some time before he had to leave. 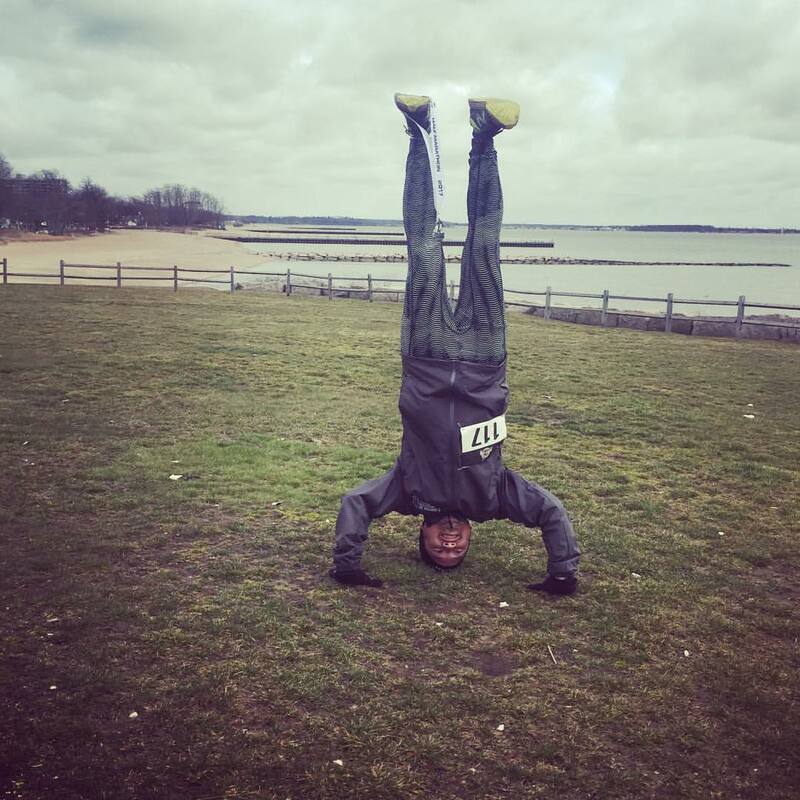 So, marathon #32 became half marathon #82 instead, but at least I got another long distance race finish in... oh well... Connecticut, I'll be back! I've been to Texas several times in my life, especially having grown up in Kansas. 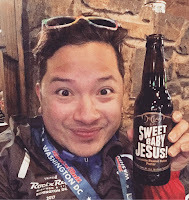 Most recently, I was in Austin back in February for the Austin Marathon. I've been to the Dallas and Fort Worth area several times, San Antonio a handful of times, and Houston and Austin a couple times apiece. That covers the five largest cities in the state. I've also driven through North Texas on the way from Wichita to Albuquerque, where it passes through the fragrant cattle ranches of Dalhart, Texas. But I had never been to West Texas, the extreme western reaches of the state, where the climate is more desert like than anything else, and the elevation is highest in the state. In fact, it's so far west that El Paso is actually closer to San Diego than it is is to Houston! But why West Texas? Well, El Paso is the closest major airport to the area where the Bataan Memorial Death March takes place, in White Sands Missile Range (WSMR). 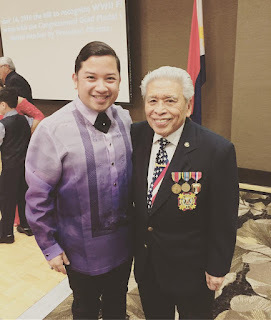 This year is the 28th year of the memorial march, but more importantly is the 75th anniversary of the actual march that happened in the Philippines. This is not really a race... it's an experience. In fact, one should not go through this event not thinking about it as a race, but more of as a way to pay homage to a bygone time. 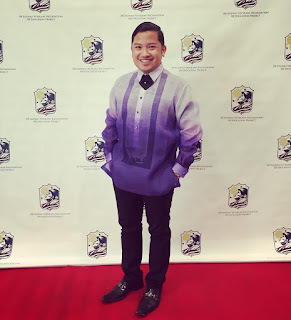 Through my participation in Broadway Barkada, I was connected to Ben de Guzman when I was in DC in 2014 to perform at the Kennedy Center for the "After the Storm" concert, a benefit for victims of Typhoon Haiyan that devastated parts of the Philippines that year. 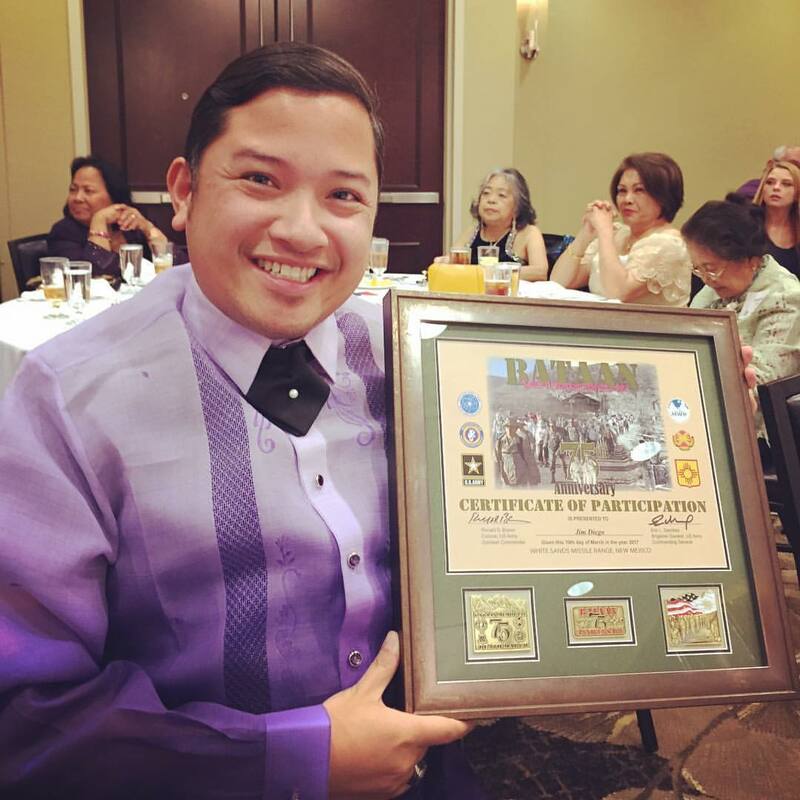 Ben (a college friend of Broadway Barkada founder Liz Casasola) serves on the executive committee as outreach director for the Filipino Veterans Recognition and Education Project, or FilVetREP for short, and reached out to me about my potential participation in events commemorating the Bataan Death March. It just so happened I was already planning to participate in the 2017 march, so this worked out quite well. This being the 75th anniversary, I thought it would be important to participate as there were few survivors of the march still living - even fewer Filipino survivors. More importantly, my great-uncle, Ulrico Causing, who was a soldier in the Philippine Army, was a casualty of the Bataan Death March, perishing at the age of 21. 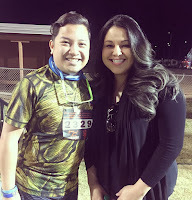 I would be running in his honor. Through communications with Ben and other members of the FilVetREP team, I agreed to participate in their gala honoring Filipino veterans and celebrating the recent signing of bill into law by President Obama, recognizing Filipino veterans from World War II (who, at the time of the war, were considered Americans, as the Philippines was then a Commonwealth under United States rule) with the Congressional Gold Medal. The gala would occur in El Paso the night before the march. 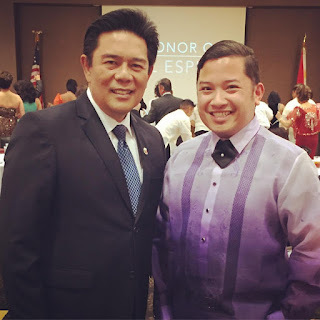 Additionally, FilVetREP was the primary contact for march organizers with the Filipino community, and through negotiations, they were able to include "Lupang Hinirang," the Philippine National Anthem, in the opening ceremonies to be performed for the first time in the 28-year history of this event. I was given the honor to represent Filipinos by performing this song for all those in attendance. My participation in the march became even more important, and more meaningful! I had a super early flight on Saturday morning that took me to Atlanta, and then a lengthy layover before my flight to El Paso. I took advantage of my Priority Pass Select membership and spent a couple hours at The Club at ATL, having a light breakfast, before heading to my gate several terminals over. 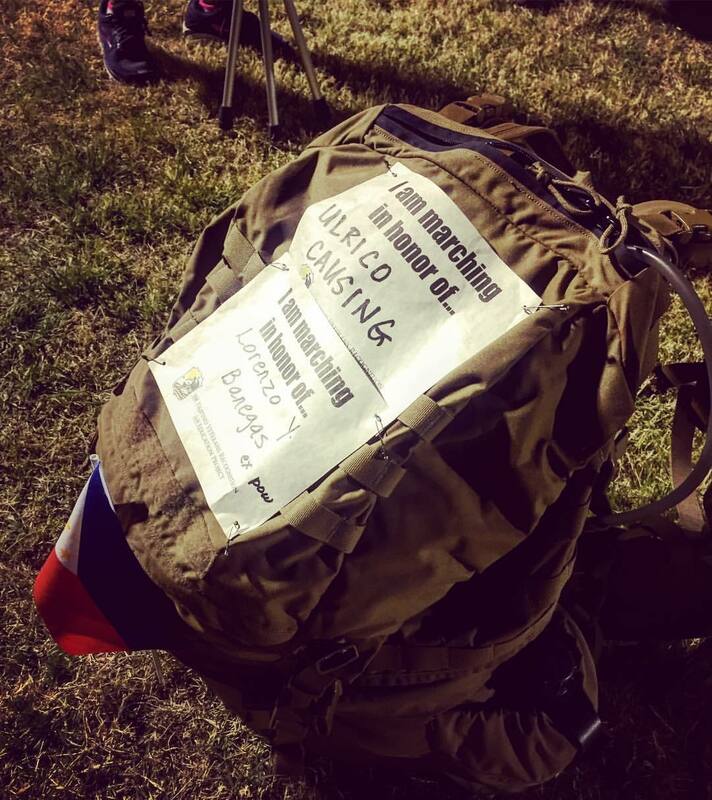 Upon arriving at the gate, the plane had begun boarding, and I could already tell, a majority of the plane were participants in the military and ROTC divisions of Sunday's Bataan Memorial Death March. I got into El Paso at about noon, and called the DoubleTree in the downtown area just as we landed so their complimentary shuttle would be ready to pick me up as soon as I exited the plane and walked out the door. And wow, it was HOT when I arrived. I had left New York City and its just above freezing weather and landed in El Paso, where the temps were easily into the 70s. 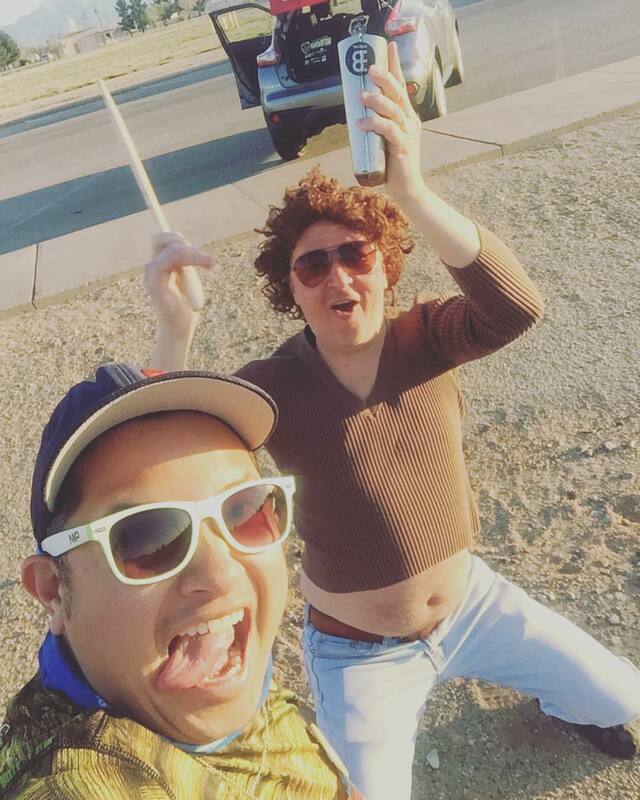 Being that we were in the desert, it was a dry heat. The shuttle was waiting outside to bring me back to the hotel just as I got outside, and I was checked into the hotel by 12:30. 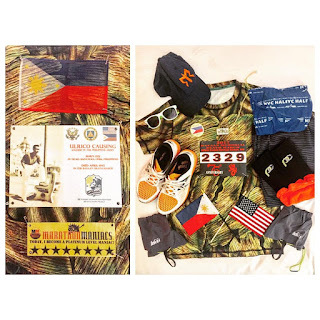 The rest of the folks I was meeting up with for the day's events were still out at White Sands, repping FilVetREP at "in-processing," where participants could retrieve their bibs for the race and get official Bataan Memorial Death March merchandise. I had arranged for one of these folks to retrieve my bib as I wasn't going to be able to get myself all the way to White Sands to get my things on Saturday with all the events happening that day after my arrival. 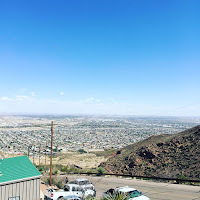 In my research prior to leaving for El Paso, I found out that one of the local sites, the Wyler Aerial Tramway, was having a special event on Saturday afternoon commemorating its 16 year anniversary of being open to the public as part of the Texas State Park system. 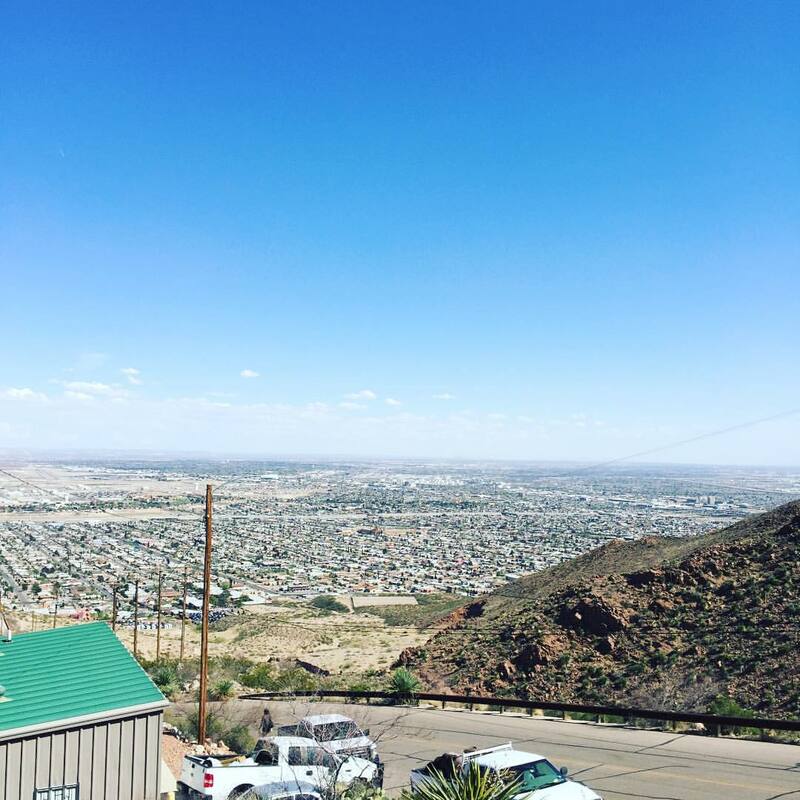 The tramway is located on the eastern side of the Franklin Mountains that look over El Paso, and sits at an elevation of 4,692 feet. The gondola ride up the side of the mountain brings visitors to the top of Ranger Peak, another 1,000 feet up. On a clear day, visitors can see 7,000 square miles around, covering three states and two countries. Today's celebration marked the busiest day of the year, and everyone was to use a shuttle transporting visitors from a senior center's parking lot along the steep main road to the bottom of the tramway, as the tramway's parking lot was being used for food trucks and entertainment. Well, it was a disorganized mess - despite taking an Uber all the way up to the site, State Parks police were only allowing the shuttle to transport visitors back and forth, and the line was growing ever longer. The shuttle bus - SINGULAR shuttle bus - was a VERY slow ride, so people were waiting in line in the oppressive 85º Texas heat for upwards of 30-45 minutes, probably up to an hour for some. I finally got my way up to the bottom of the tramway, and immediately headed for the food trucks... of which there were TWO. Literally, there was so much space up there, but the parking lot was being used by two food stands and the majority of the rest of the lot was underutilized for a tent, an entertainment area, and a few tables exhibiting the Texas State Parks and other local organizations. After getting my fill of some food, taking in the beautiful view, and enjoying the Mexican folk dancing by local dance groups, I decided to head back down as the lines for the tram itself were another hour of waiting. 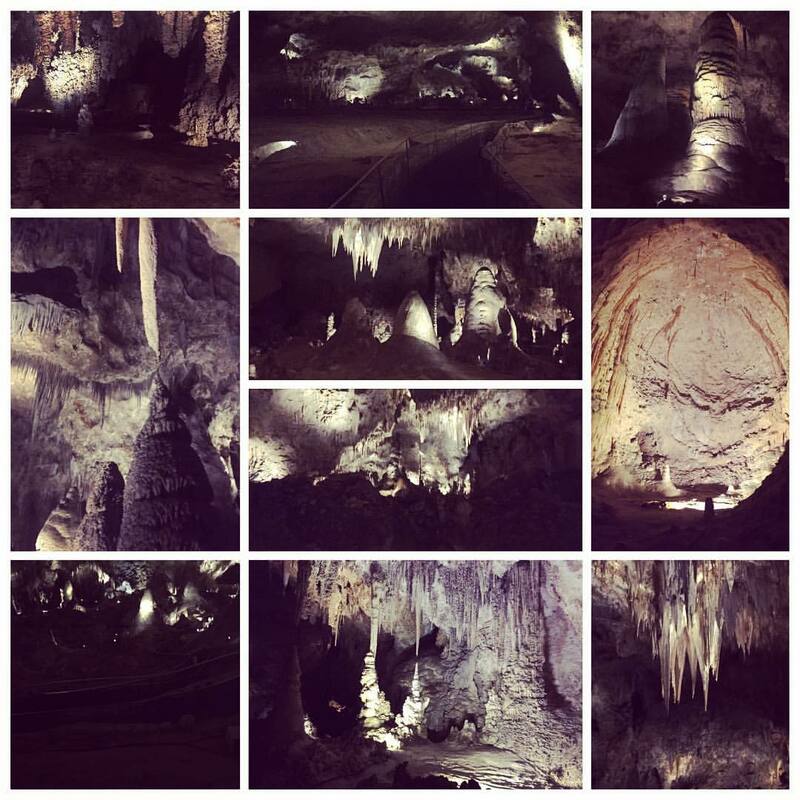 I got some great photos of the views anyway, and I was losing time needed to prep for the gala that night. Instead of waiting for the shuttle, I joined a few other fit-looking folks (likely college students?) and hiked my way down the road... well, ran most of it. 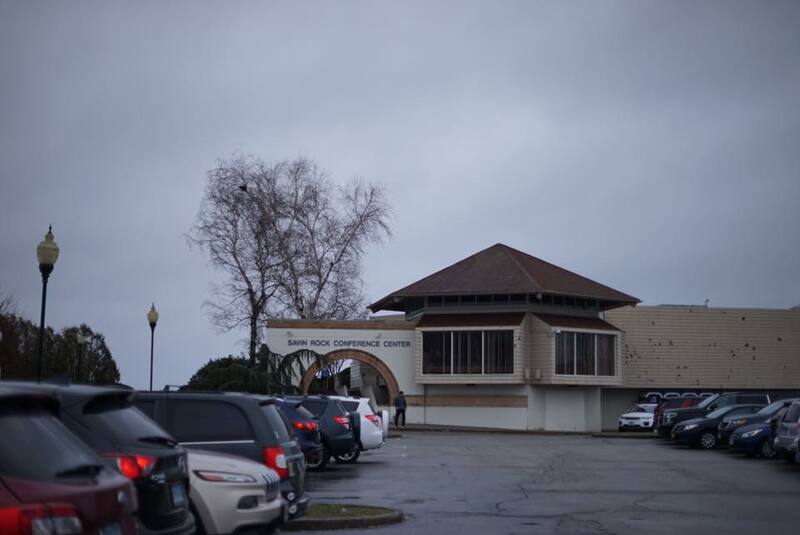 Thankfully, despite the low cellular signal, I was able to get an Uber to pick me up at the senior center's parking lot and take me back to the DoubleTree. While many continued to take advantage of the gala's dancing part of the evening, I called it an early night, as I was going to wake up SUPER early the next morning to get into the van shuttling us to WSMR by 5:20am, as it was about an hour drive there, including the security checkpoint as cars enter the military installation. I set out all my clothes and got into bed by around 11pm, getting a good six hours of sleep, and then more sleep on the drive out in the van provided by FilVetREP. Upon arriving at WSMR, we were surprised to see many folks already parked or just waking up from camping overnight onsite. There was a slight chill in the air, but being in the 50s, I was quite content with the weather, having escaped temps nearly 20 degrees lower. The klieg lights lit up the pre-dawn sky, especially on the grounds where the opening ceremonies were taking place. The area for the opening ceremonies was filling up quickly. 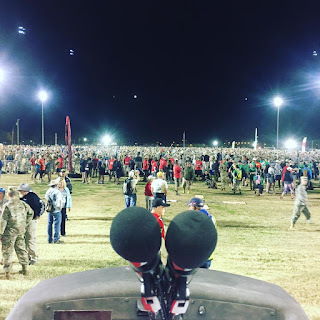 7,200 people were signed up to participate in the event, the most ever - they had upped the registration totals specifically for this 75 year annivesary. Something like 6,304 marchers were present to start the march. 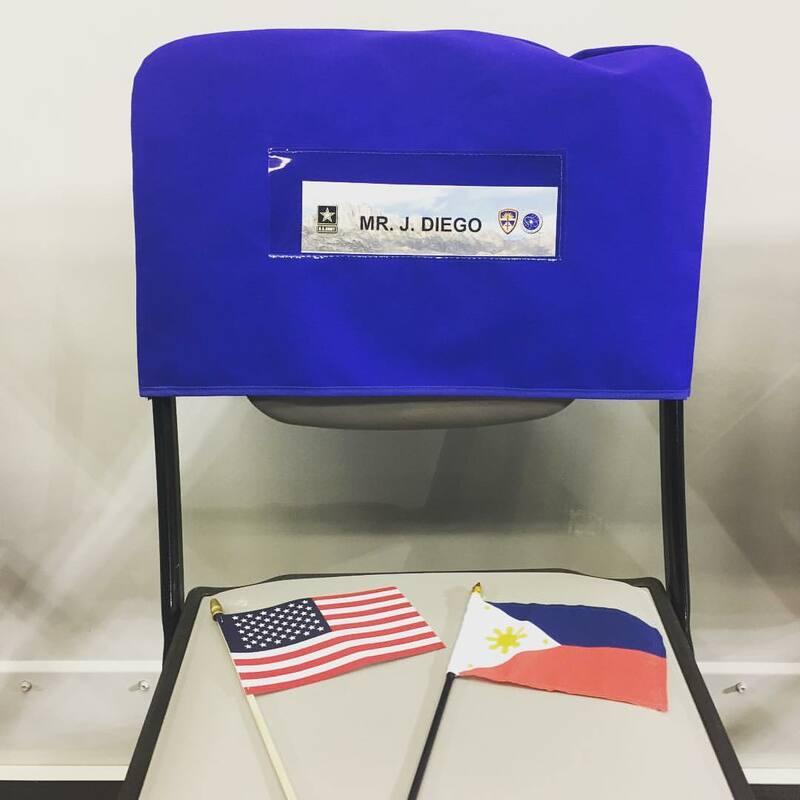 Our group of FilVetREP folks organized ourselves near the front, and I found my seat on the stage alongside the American national anthem singer and the three officers speaking. The solemn opening ceremonies began with the presentation of the colors. After taking their place on the grounds, I came up and sang "Lupang Hinirang" in front of a crowd of probably somewhere around 9,000 to 10,000 people (marchers plus onlookers and invited guests), the largest audience I've sung in a different language for. Shortly thereafter, Patricia Campos, a local singer and radio personality from Las Cruces, came up to perform the "Star Spangled Banner." 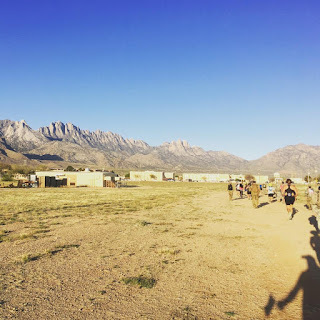 For both of our performances, you could hear a pin drop - with the booming speakers going back to the people all the way in the back, and the Organ Mountains in the distance reflecting back the sound, the echo could be heard miles around us, and the reverb would last for another 5-7 seconds. It was exhilarating to be up there and to sing the Philippine National Anthem, something that had never been done in the 27 prior years of this event. I wasn't nervous... though after I sang, I felt like I couldn't stop shaking... I had just made history. Or maybe it was just the desert morning chill in the air as the sun hadn't risen yet. A marcher rucks in honor of my great-uncle. 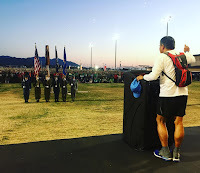 As the sun began to peek over the horizon, WSMR Commander Brigadier General Eric Sanchez and WSMR Garrison Commander Colonel Dave Brown both spoke before the invocation was given. Major General Taguba also made some remarks to the marchers. 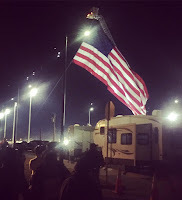 And ritually, the names of original march survivors who had passed since last years' memorial march were spoken - it was very sad to hear so many names - the mistress of ceremonies Cammy Montoya read three pages worth. It became very real to understand that as our veterans get older, their time with us gets shorter. I could see some people in the VIP areas surrounding the stage get quite emotional over this portion of the event. Cannons were fired from nearby, and the opening ceremonies ended with the US Army Special Operations Command parachute team, the Black Daggers, jumping from a plane high above our location with both parachutists landing squarely on a target on the field with such precision! 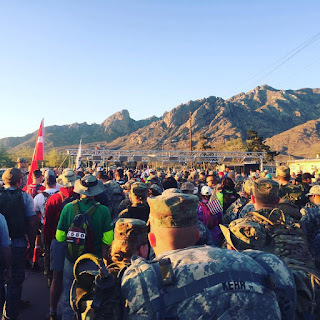 Finally, we were off to the starting line, with World War II survivors there to cheer us on, and the Wounded Warriors to be the first to step to the line. I found Mr. Cabacar near the sidelines and took a photo with him before I stepped off and began my march. 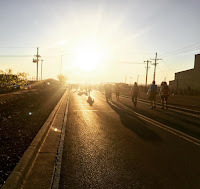 It was pretty crowded at first, making my way on the east edge of Ripley Street around those who were walking, and I rounded the corner onto Martin Luther King Jr. Ave, with the morning sun in my face, distorting my vision. About 3/4 of a mile in, the infamous cowbell guy was there, doing his thing, cheering on the marchers baring his unintentionally (or intentionally?) exposed midriff leading the charge. I had to take a quick picture, of course! Morning sun on the horizon. I secured a 10:25 first mile, which was obviously labored due to the high elevation that I wasn't used to. While the first 1.5 miles of the race kept us on a nice steady 100 foot downhill coming down from 4,300 feet up, you could definitely feel it. We made a turn onto Wesson Street heading northward, as we transitioned from asphalt to gravel. We passed by a parked helicopter as we then made our way to the first long section of sand. Right around the 2-mile mark, we reached our first water station, and also passed by the White Sands Missile Range Museum and its notable missile park, displaying a variety of the 50 or so missiles and rockets tested at White Sands since 1945. We then began our long northeasterly trudge through the sands - at first, slightly downhill until the 5 mile mark, featuring various levels of sand depth. 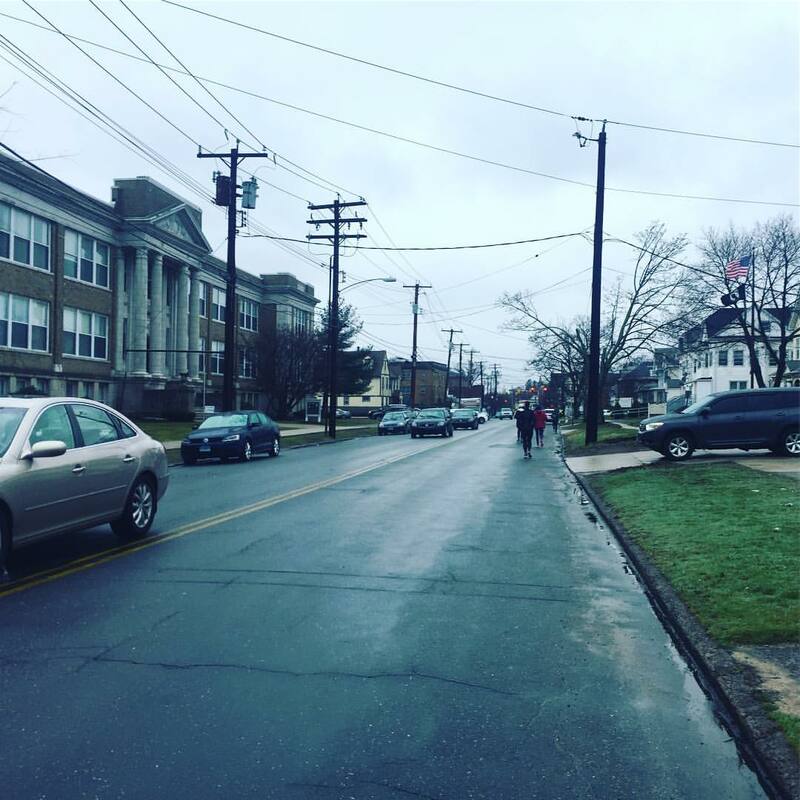 With the temperatures starting to rise incrementally, and the air still thin from the elevation, I already began to feel the effects of doing cardiovascular exercise. 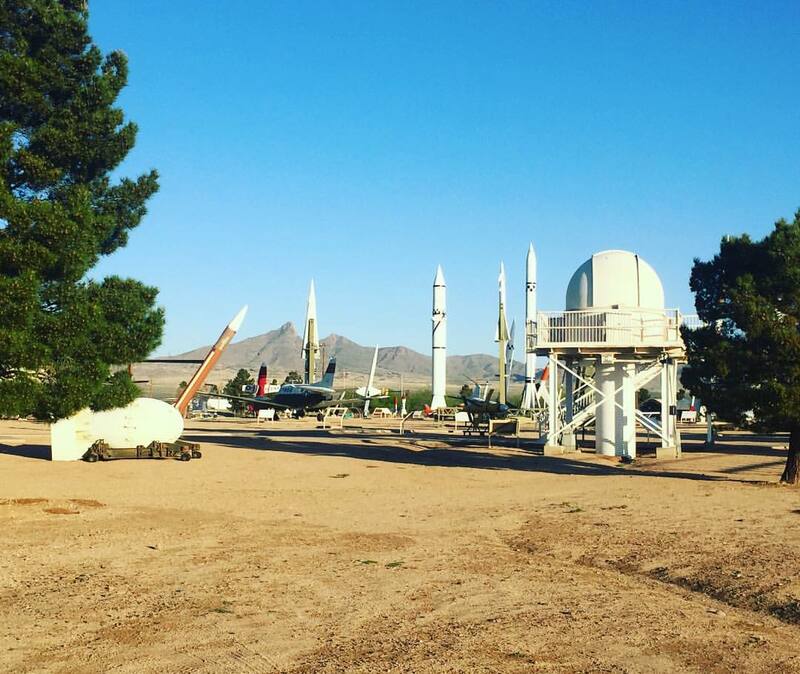 examples of missiles and rockets tested at White Sands since 1945. Our first taste of sand, with the Organ Mountains in the background. A helicopter in the distance, as two women march by. Throughout these first few miles, I began to play a little leapfrog with Shelby and Jan, two friends from Roswell, and Loyd, a FilAmTri member formerly of New Jersey who had moved to Texas recently. We got to know each other through some walk breaks as we made our way up into the mountains over the first few miles. 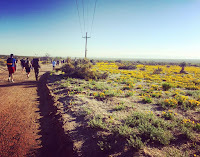 We passed fields of beautiful yellow poppies, as far as the eye could see. 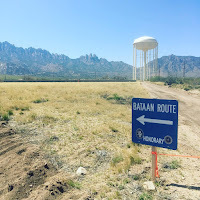 Someone who had marched in previous years said this was the most brilliant they've looked in all the years that the Bataan Memorial Death March had run through this area of the missile range. 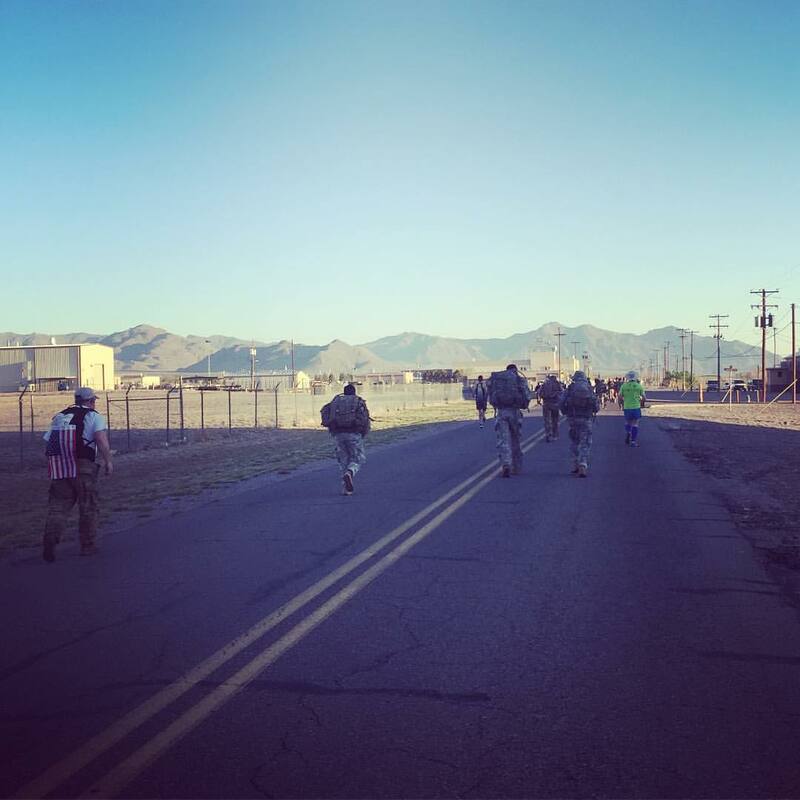 I was also in awe of the so many awesome marchers competing in the heavy division - these "ruckers," who not only were marching with their minimum 35 pound backpacks - some were doing it in crews of five, making sure that each other was ok and able to keep up at a similar pace! There were young college ROTC kids and service members, both men and women, many passing me at a blistering pace! At around the mile 6 mark, we turned a corner, and began to run in the southwesterly direction with the brilliant vistas of the Organ Mountains framing the landscape in front of us. This was also where the course began to go uphill, and boy could we feel it. Seemingly, the sand was also a little more viscous, and despite my gaiters purportedly keeping sand out of my shoes, I could feel a buildup of granular debris in my left foot. 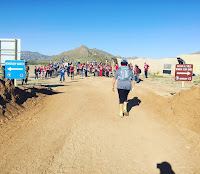 We were about an hour and a half into the march as we went west, and in the distance, we could see an outcropping of vehicles - lo and behold, it was the 8 mile mark, and Owens' Road... and also the place where marathoners would turn right and honorary marchers would turn left. 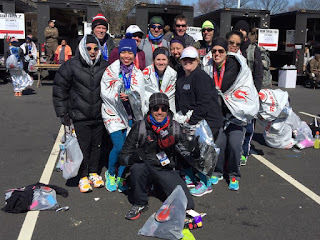 After getting our bib scanned, we got to utilize the aid station, which was very well stocked. A bunch of cots lined up along the side of the road, and I stopped quickly here to take the sand out of my shoes for the first time - and boy, was there a decent amount! I was wearing my New Balance Zantes that has multiple layers of mesh in the forefoot, so the sand was going to get in regardless of the fact I had gaiters on to keep sand from coming in above my ankle. It had even seeped into my socks, so I had to take those off and clean out between my toes and shake out the sand grains from in my socks' fabric. I quickly got the shoes and gaiters back on and continued down Owens' Road, which provided us a short 1/2 mile downhill - a nice respite from the uphill we had been experiencing. sun's heat, making it feel even worse! But little did I know - that was just the start of it. 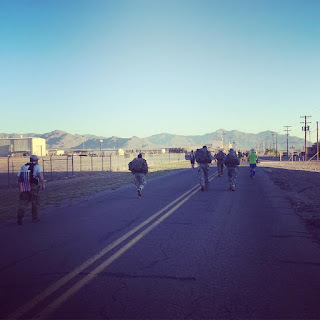 As soon as we got past U.S. 70, we were on an uphill battle along WSMR S Rt 280 that would take us from about 4,300 feet in elevation and 8.7 miles into the march all the way up to 4,900 feet and 11.3 miles - ALL on asphalt. The gradual march uphill and the soaring temperatures, with the sun beating down onto the blacktop was making it feel even hotter than actually was, and for once, I (along with others) were wishing to get back onto the sand. Meanwhile, back at the 10 mile mark, the leaders of the march were coming out of the loop in the mountains and emerging back onto the road, nearly eight miles in front of us. 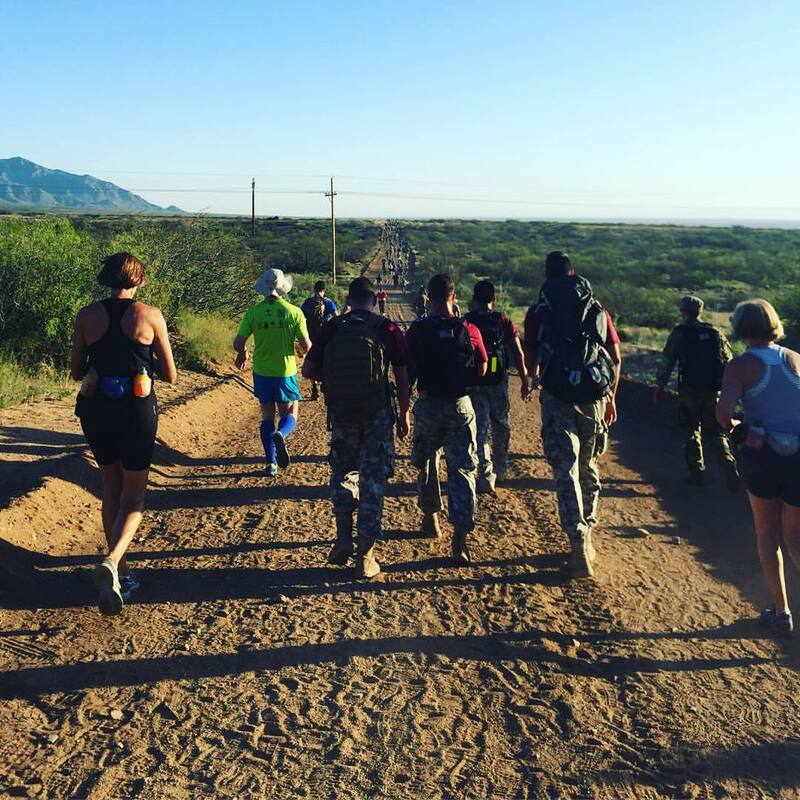 We turned left into the sands at roughly the 11.3 mile mark, and continued to head uphill practically up to the halfway point of the race. 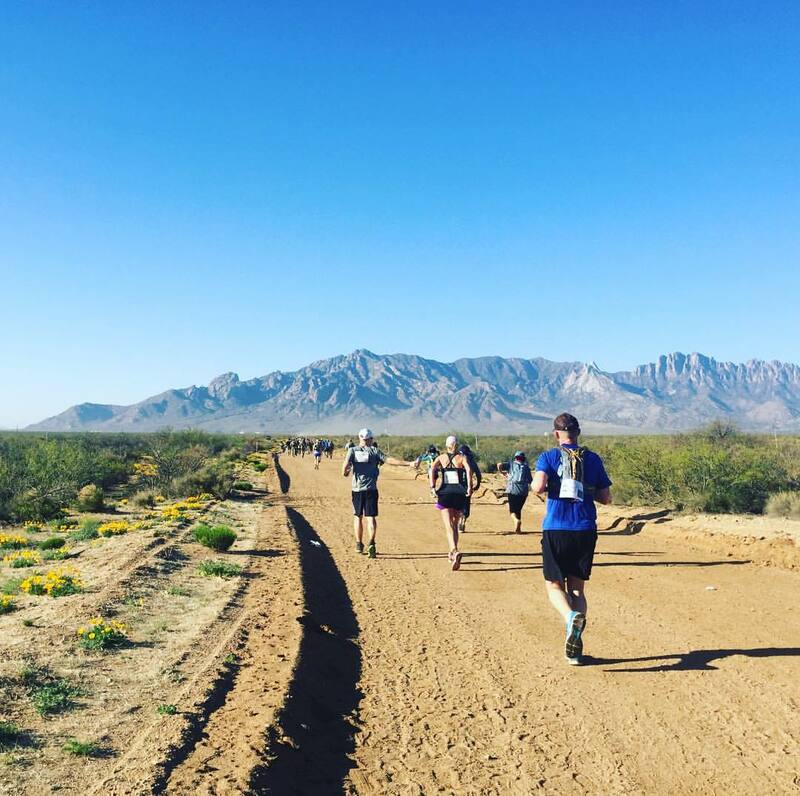 By then, we reached the highest point of the race, at 5,408 feet in elevation. That's 1,356 feet of rise from the lowest point on the course. At this point in the race, the sun was relentless, and we were only halfway through our march - with 3 hours and 10 minutes already having elapsed. We reached another checkpoint at the top of this hill, and suddenly, the sandy path began to elongate and feel easier to run on. Maybe it was just my mind playing tricks on me, but there seemed to be more areas of clearer trail - basically, less deep sand. I zipped through the next three miles as we lost 600 feet of elevation. And then for a mile, the course elevation started to roll a bit. I met fellow Marathon Maniac Heather along this part of the course; as it turns out, she was cheering along the Miami Marathon course back in January, handing out frozen treats late into the race - and we had several mutual friends! There were parts of this area where the downhills were pretty steep, so I had to be a little more gingerly with the way I was proceeding downhill. The section of rolling hills was short-lived, as we came upon the 18 mile mark, and the trail gave way to the asphalt once again. I stopped for a much needed bathroom break, and also took some time to remove sand out of my shoes for a second time - and it was necessary, as there was a lot more I had to take out. After I thought that I took enough sand out, I unclipped my gaiters from my shoes, and proceeded to run downhill along the road, to try to make up some time that I had lost and passed quite a few folks. "Warning. Entering active test range. 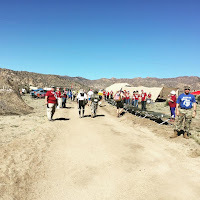 There were actually quite a few marchers still making their way up the road, so I felt bad that they were going to have to experience another 8-9 miles of rough terrain and unrelenting sun. I was 4 1/2 hours into my race, and we had reached the noon hour. 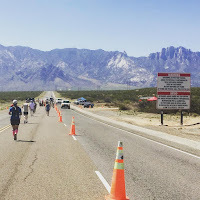 I barreled down the asphalt road, making my way back to where the honorary marchers and marathon marchers had separated, which at this point for me was the 20 mile mark, meaning I still had a 10K left to go - and the hardest part of the course still yet to come - the dreaded sand pit. We went further down Owens' Road, and then turned right back into another sandy trail, turning into the path where the infamous Sand Pit lay. 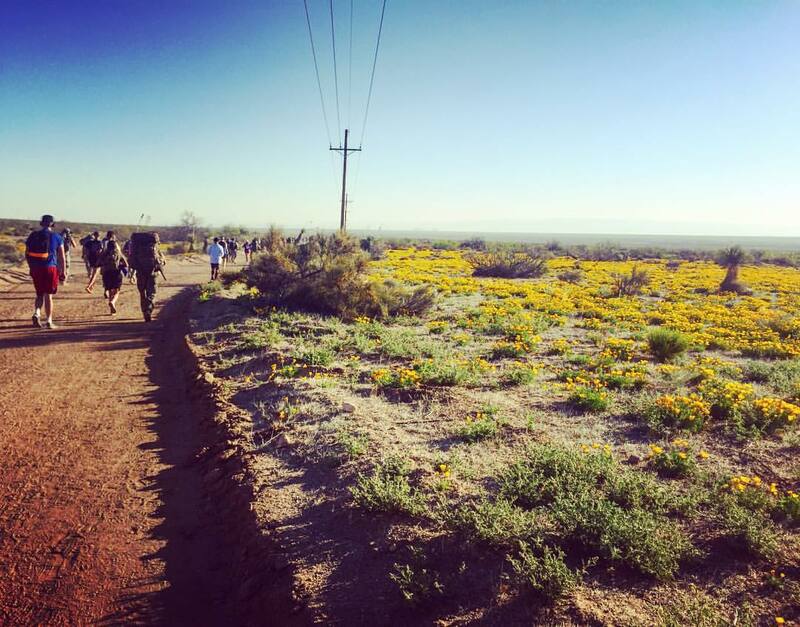 I stopped at the four-wheeler that marked our turn in, manned by two border patrol agents (agents actually acted as roving security and emergency action personnel throughout the race), and reattached my gaiters knowing this was the part of the race I would need these the most. The mile and a half Sand Pit put us in the most difficult trail to maneuver in, where the steeply banked arroyos filled with sand would sink our feet ankle deep. 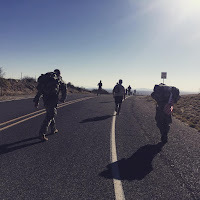 We trudged through as best as we could, wiping sweat from our brow, and just thought, "left foot, right foot, left foot, right foot," as we zig-zagged through the high desert terrain. When the sands became less of a problem, we breathed a sigh of relief - we had just gotten through the worst of it. All that remained was just distance. A long straight shot of two miles lay between us and the stone fence that surrounded the White Sands community. But this two mile section was tough. My energy was completely zapped from just getting through the sand pit. Despite its relative flatness, I took more walk breaks between short jogs and got to the 24 mile mark at roughly the six hour mark. Though I was a little disappointed I was unable to finish under the six hour threshold, I had to remember - these conditions were TOUGH. Unbearably hot, dry desert air, high elevation, uneven terrain. 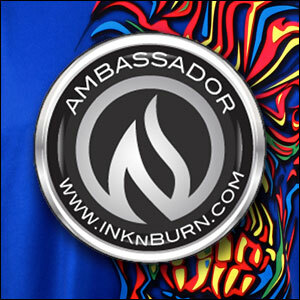 It wasn't about the time I'd finish in - it was about the fact that I could finish, and the experience I had out there. The last two 2.2 miles took us right alongside the stone fence, a fence that seemed to go on forever and ever. In the distance was a water tower where we would go around, and would actually have the ONLY actual shaded part of the race for a matter of feet. 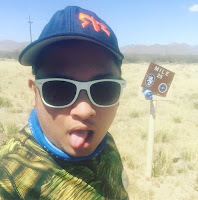 I just kept on as best as I could as I approached the 26 mile mark, and then I ran it in, as we emerged out of the sands and back onto the road. On either side was metal barricades, as people cheered me into my finish. 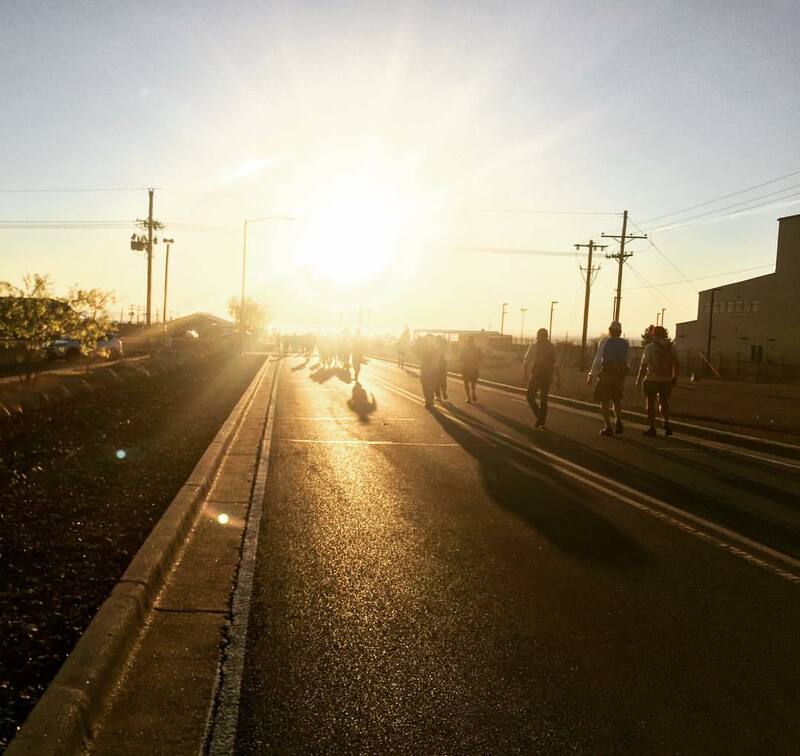 Barely a hundred feet away from the finish line, all of a sudden, the ever present sun darkened a bit as a small, fluffy, white cloud covered it for the first time the entire day. As I ran with both the Philippine and American flag in each hand, I looked up and shook my head, yelling "NOW you decide to cover the sun. THANKS!" 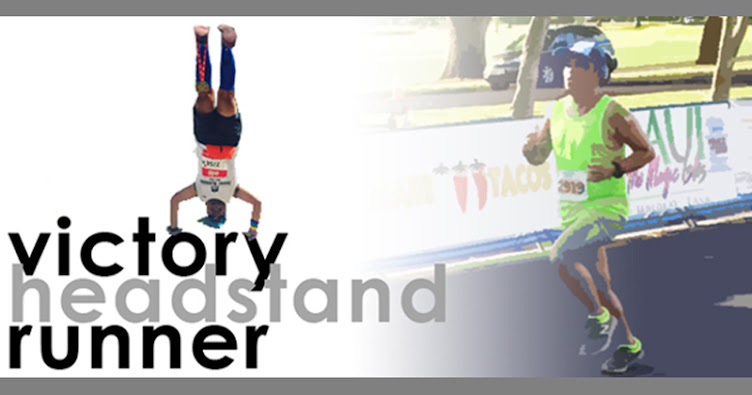 I crossed the finish line in 6:37:14, thrilled to have completed what easily was my most difficult, but most memorable race. I quickly greeted 96-year-old retired Chief Master Sgt. 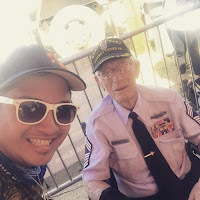 Harold Bergbower, one of the last remaining survivors of the Bataan Death March, before going on to find the rest of the FilVetREP group, many of which had finished the honorary march an hour or two earlier. I took my shoes off to reveal even more sand had accumulated in my left shoe. So, the gaiters weren't effective with mesh-covered running shoes, but I knew that from the start. I got some much needed shade and sustenance, before we got back on the road to head back to El Paso. But before we left, we had to find out the status of one of the members of our group, who had been left in the medical tent, possibly dealing with heatstroke, but we later found out was a nasty stomach bug. 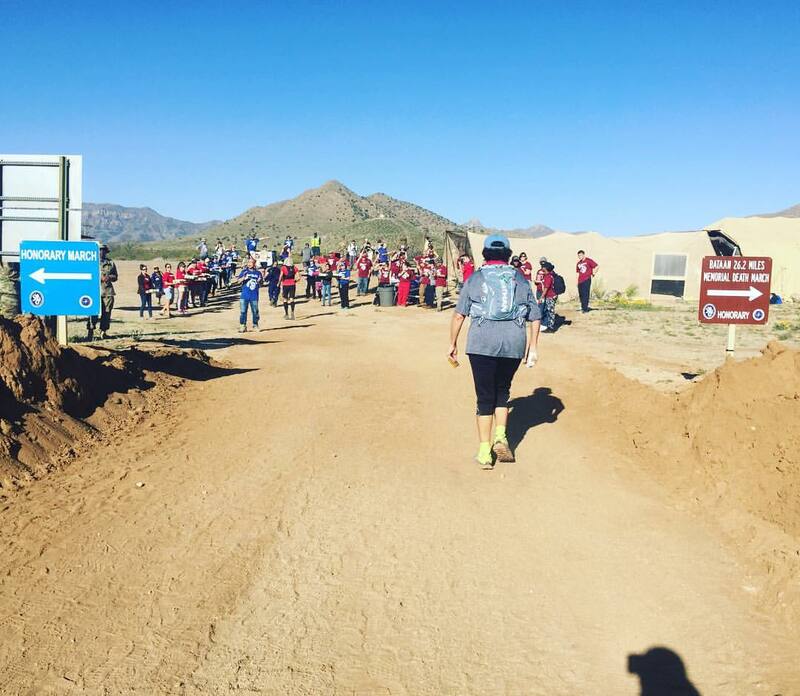 She ended up in the hospital at Las Cruces, but with lots of us worrying for her health - she ended up turning out just fine, and was able to return home the next day - a little worse for the wear, like the rest of us having dealt with such rough conditions under the desert sun. Victory headstand in the high desert! Upon arrival back at El Paso, I quickly took a shower, and then was able to ride in the shuttle to El Paso Airport so I could retrieve my rental car for the next 24 hours. I got back to park the car and then immediately headed out for dinner with the remaining FilVetREP folks at Los Bandidos de Carlos y Mickey's, a well known Mexican establishment in the area. Dinner was great, as was the conversation, though I started to feel a little fatigued, and got back to the hotel to quickly repack my bags as I had an early morning planned on Monday. After a rough night of sleep, I woke up feeling pretty awful, but got my stuff together and went off on my planned Monday adventures. 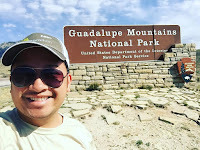 My plan was to see two national parks that were about 1 1/2 hours and 2 1/2 hours east of El Paso, respectively: Guadalupe Mountains National Park and Carlsbad Caverns National Park. I managed to get to both, with nap breaks in between, and had a nice time checking out both places despite how bad I felt. 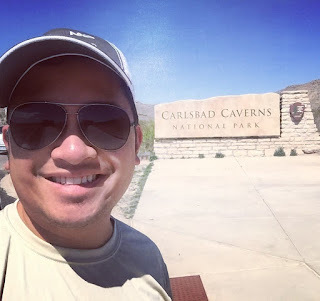 Carlsbad Caverns was especially fun, as I descended an elevator 750 feet below the surface to the caves, and then hiked a two mile long circuit with various elevation changes. Looking back, it was kind of risky to be doing what I did under the conditions I was feeling, but I'm a man with an agenda! 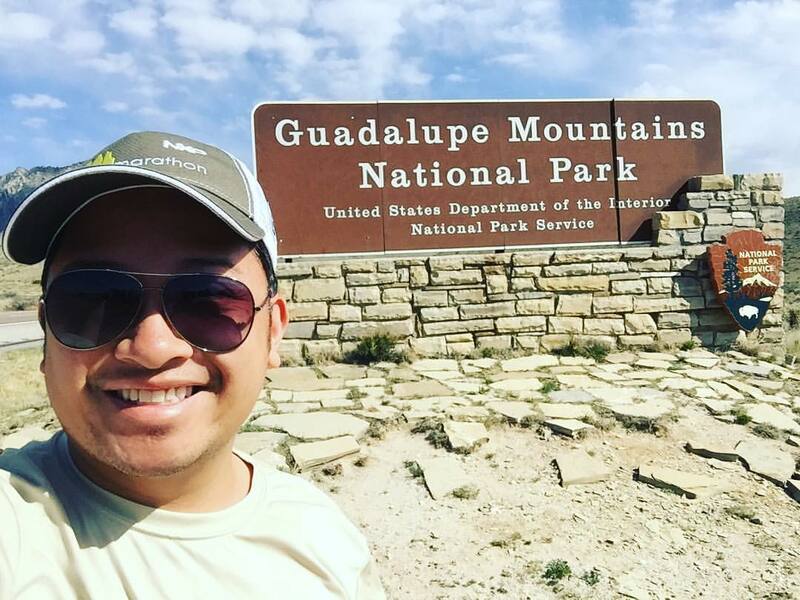 I drove back to El Paso late that afternoon to get my flight back, very close to running out of gas in my car before I finally got to one closer to El Paso. These remote locations have no gas stations for miles... literally. 120 miles between gas stations along this road. My fuel tanks were at E and blinking at me before I finally was able to put a gallon in just to get me to the airport. The "Big Room" of Carlsbad Caverns, 750 feet underground. And then the airport... well, when I finally got back to the El Paso city limits, I was able to get signal on my phone. And that's when I realized the first leg (El Paso to Phoenix) of my flights back to New York was severely delayed by about 2 1/2 hours. At that rate, I would just miss my connecting flight in Phoenix. So, while standing in line (I had to check my bag for the flight back as I couldn't fit my framed Certificate of Participation for the march into my suitcase), I managed to rebook my second leg as a flight to Washington DC, where I would connect to a flight to LaGuardia arriving at 9:30am, about four hours later than planned. At that point of the day, I was just feeling amess. 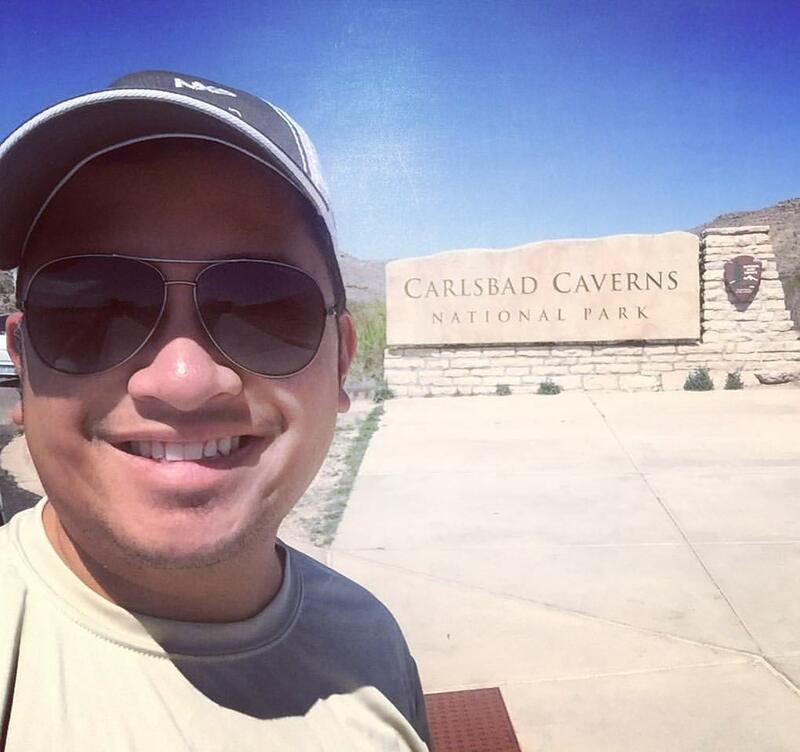 My throat was super sore, I was starting to feel feverish and chilly at the same time... At this point in time, I realized I had gotten some late-onset heatstroke symptoms, and my immune system was in bad shape. I got my bag checked and my new boarding passes, and then met up with some FilVetREP friends who were at the airport at the same time, either experiencing similar flight delays (or in the case of Ben, a cancellation... sorry, dude) or just a late evening flight. We stuck around at the Starbucks in the airport for about half an hour before I went through security to get to my gate. I got to Phoenix in one piece (still feeling awful) and then trudged through the long terminals to my connecting flight to DC. I was able to sleep that entire overnight leg, and then got to my last connecting flight after notifying my boss that I was arriving late and feeling pretty sick, so I was not going to come into the office. I got into LGA at 9:30am, as planned, and then headed straight home to be in bed for the next two days. 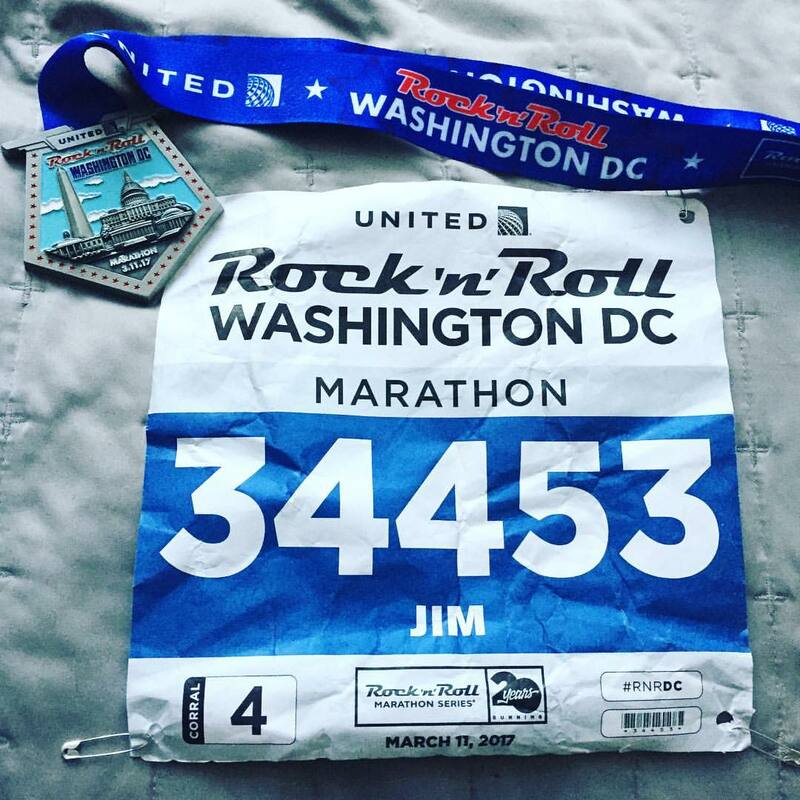 Looking back, this was most definitely the toughest marathon I've ever done, which was followed by a really taxing recovery period. While 7,200 were registered for the race in multiple capacities (either marching the full 26.2 miles or doing the honorary 14.2 miles; either military, ROTC, or civilian; either marching individually or on a team; and either rucking at least 35 pounds or without), only 6,304 started the march. 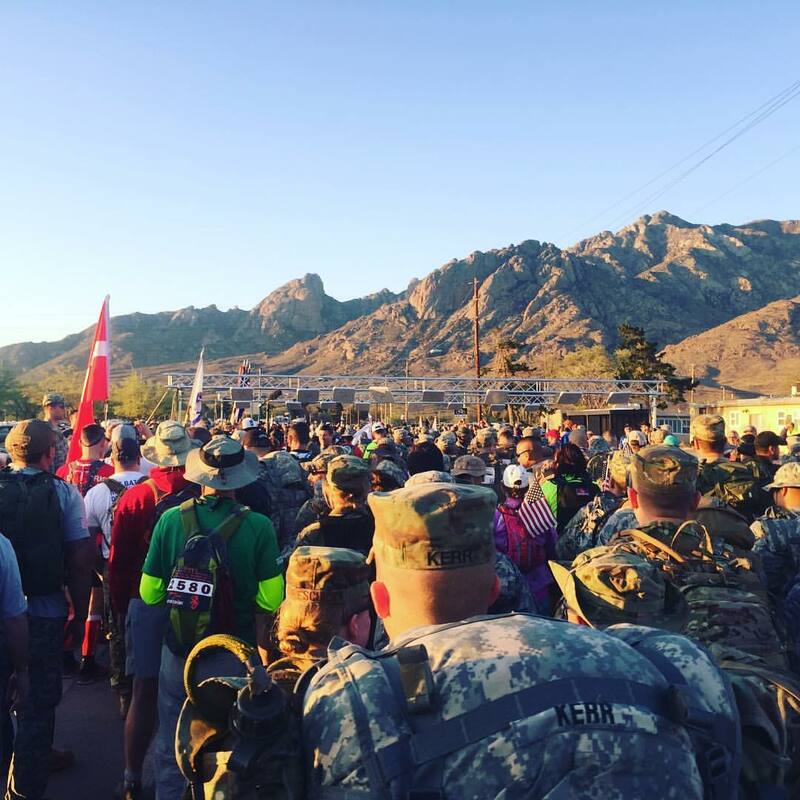 In the end, only 5,598 completed the march, which meant that 706 people (11% of the field) were unable to finish, many needing medical attention due to the extreme conditions. 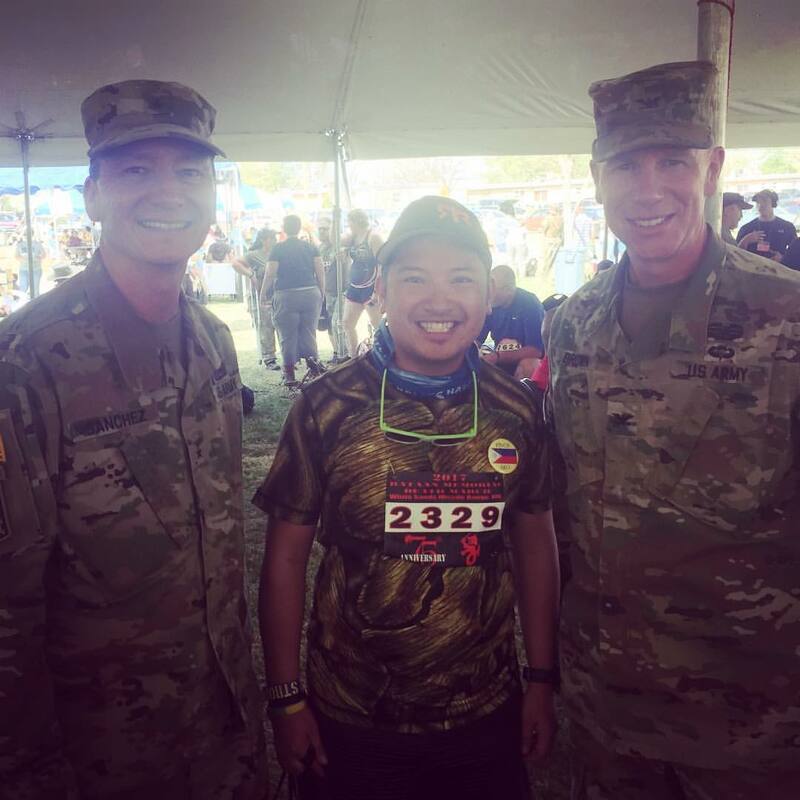 Of those that finished the full marathon and didn't ruck, the average time was 8:35:31, so I finished it two hours faster. And some were out there for an incredible amount of time; the last finisher was a Wounded Warrior, who crossed the finish line 15 hours and 14 minutes after the start of the march. 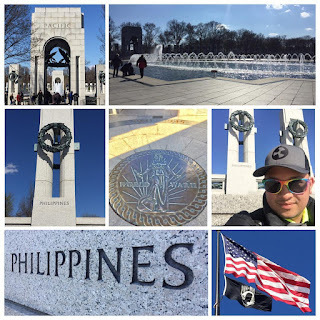 This one was truly one to remember, and one I highly recommend for people to participate in - whether as a novice or experienced marathoner - to pay homage to the many veterans who had fought for our country in World War II. 75 years later, and there are very few survivors from that war left, so it's paramount to get into this march before time takes them away. 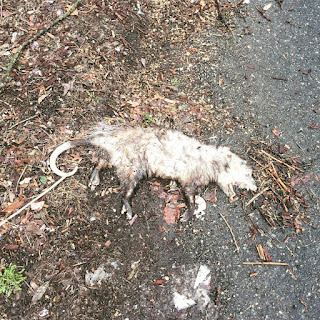 At 1pm on March 9, 2016, it was 61°, sunny with a bit of wind. 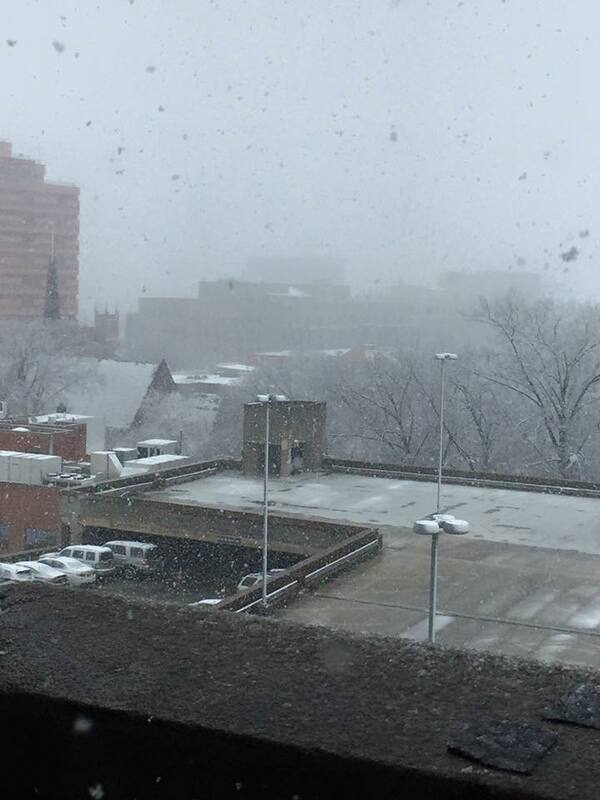 At 10:30am on March 10, 2016 it is 36°. With an anticipated 2 to 3 inches of snow. With this drastic change in temperature, I decided to leave work early after stressing about the weather. 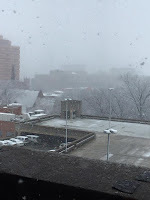 Several inches of snow fell in the morning that didn't stick, but the weather was messy enough to be concerned. My flight was leaving out of LaGuardia's Marine Air Terminal, the small terminal quite a bit away from the rest of the airport's terminals that serves Delta's "shuttle" destinations from LaGuardia -- DC and Chicago. I ended up getting to LGA at around 4:00pm. Upon arrival, and getting through security, I decided to play a game of airplane roulette. 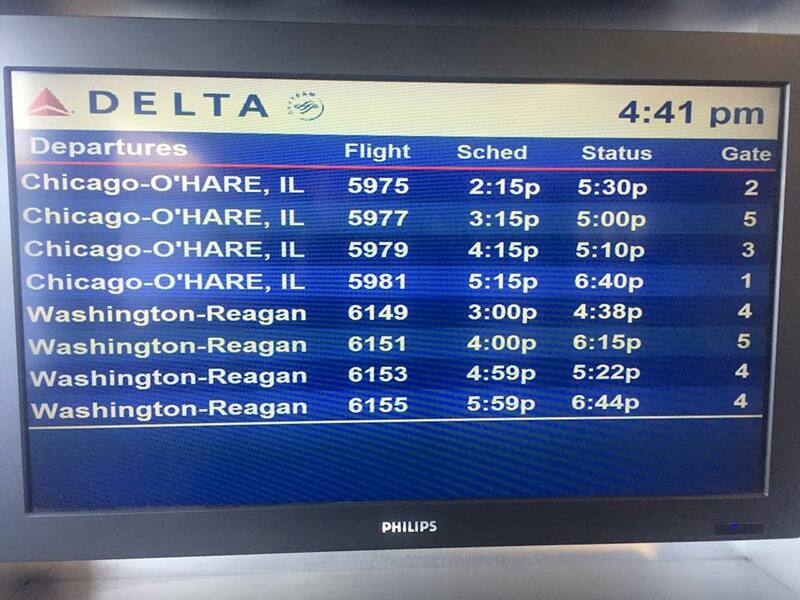 Delta allows passengers to rebook to alternative flights when excessive weather delays over an hour happen. Add the fact that Delta put up a weather advisory earlier in the week, and any flight switches become free of charge, and can be done straight from the FlyDelta smartphone app! 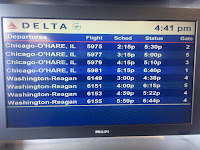 I was originally on flight 6155, but then the delays started to stack up, so when I was given clearance by my boss to leave earlier, I switched to flight 6151, which was to leave at my initial departure time. Because I arrived earlier than anticipated, I saw that flight 6153, which was slated to leave an hour later than 6151 was now going to leave earlier, so I easily switched to that. Not only that, it seemed many of the other medallion flyers who would normally take the first class seats anticipated the weather, so they had left on earlier flights, leaving first class mostly open - and despite my flight switching, my upgrades were able to move over to the new flights. I lucked out being able to fly First Class to DC, and we were able to get out quicker since we were positioned closer to the runway take-off point! It was a very short flight, and the approach into DC was quite bumpy, as you could feel the wind pushing the plane around as we flew south past Reagan National Airport, in order to make a turn around over the Potomac near Alexandria (the runways and which direction planes take off and land are dependent on the wind patterns, so in this case, we had to make the turn around.) We landed at 7pm, and upon turning off my airplane mode, I had a text message from Seth and Donna that I had a car rental waiting for me that Seth booked at Budget. Thinking of the need to have our luggage with us since returning all the way to Silver Spring after the race was not a smart option, they decided since I was already flying in, I was best equipped to retrieve a rental car from DCA that Seth could return the next day. I retrieved the car and drove into Washington DC from the airport, meeting up with Donna, Seth, Michelle, Ben, Pam, and Steve at Logan Tavern, just missing a few other folks who had been there earlier because it took me awhile to find parking nearby. The race was the following morning, so I carb loaded with some delicious steak-frites (but with garlic frites!) and then we drove up to Silver Spring to get to our hotels, with a quick detour to pick up my bib and t-shirt from Lilian's house which was on the way. After dropping Donna off at her hotel, also in Silver Spring, Seth and I settled in at the DoubleTree, which to be honest, was not that nice of a DoubleTree. We were underwhelmed. We got to bed quickly since we were planning to be out the door by 5:45 to pick up Donna by 5:50 and make it to a garage less than half a mile from the start. The forecast showed the race morning was going to be frigid. We woke up to FREEZING cold temps. We were able to park in a nearby parking structure and walked over to the start area on Constitution Ave NW. 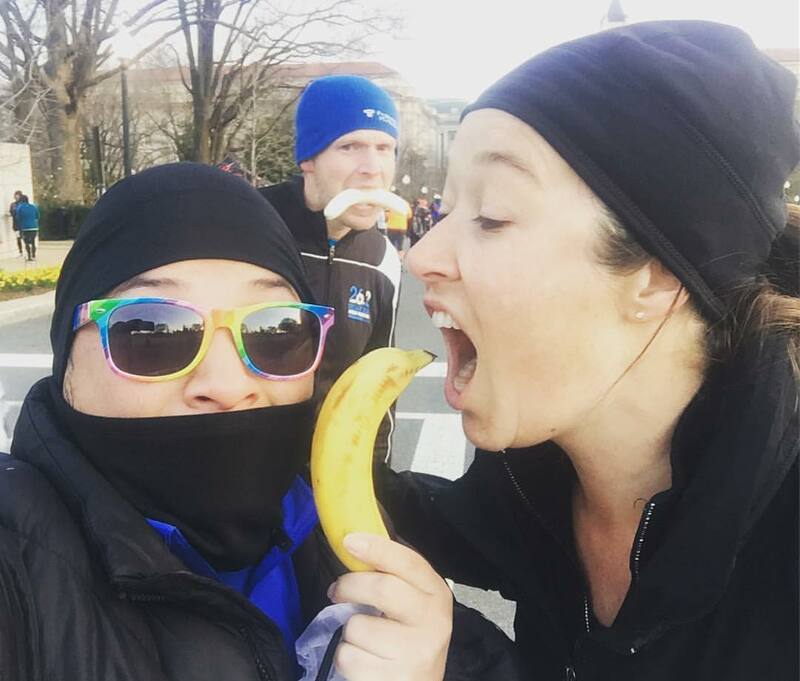 Bundled up like crazy, we got ourselves into the corrals, and at 7am, after meeting up with a few other friends, we were off, heading down Constitution Ave NW, past the White House and Washington Monument. 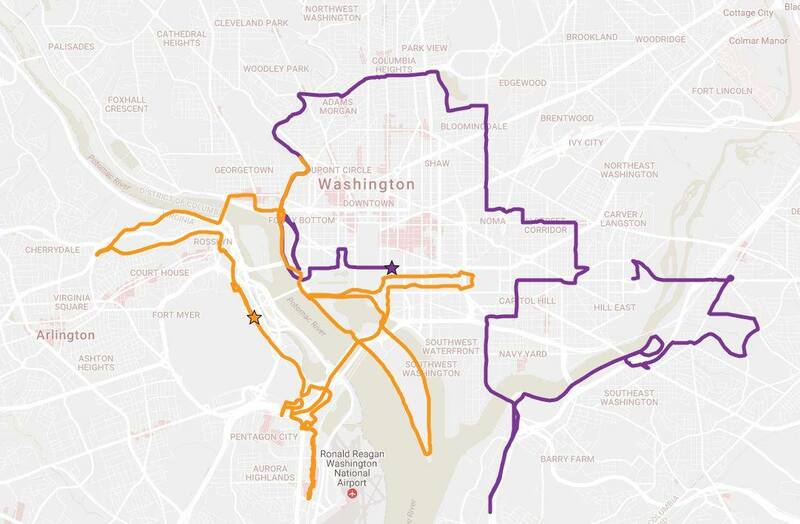 We took a strange dogleg that had us turn right onto 18th Street NW, run for three blocks to E Street NW, turn left, then left again onto 19th Street NW, before going right back where were going on Constitution. 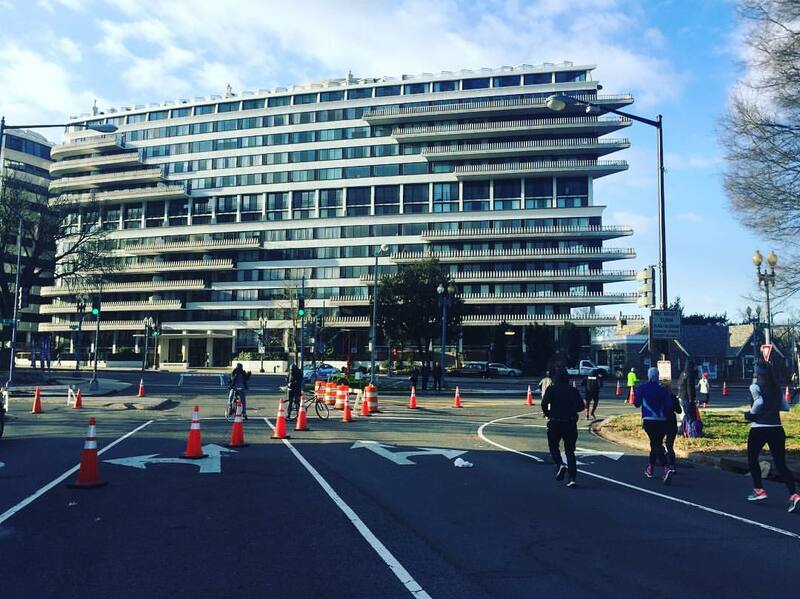 We finally turned left onto 23rd Street NW, where we encountered our first water stop (manned by members of DC Front Runners!) and positioned just before the rotunda surrounding the Lincoln Memorial. 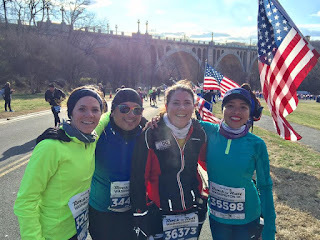 Donna, Hollie, and I had run in close proximity to each other and posed for a quick photo at this moment before continuing on, as we began to follow Rock Creek Parkway northward along the Potomac. 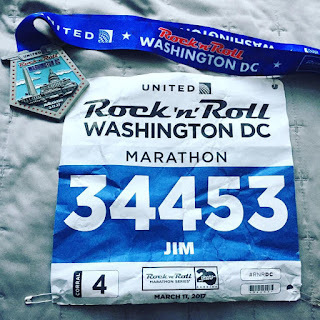 Notably, this eliminated the out-and-back on the course from two years ago when I did the half, on the Arlington Memorial Bridge that took us into Virginia for about a minute or two. With Donna and Hollie after the first water station, in front of the Lincoln Memorial. 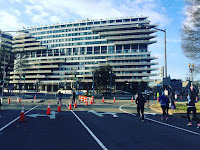 We ran along Rock Creek and Potomac Parkway, passing underneath the cantilever of the Kennedy Center terrace, and then passed a few of the buildings that make the Watergate Hotel. 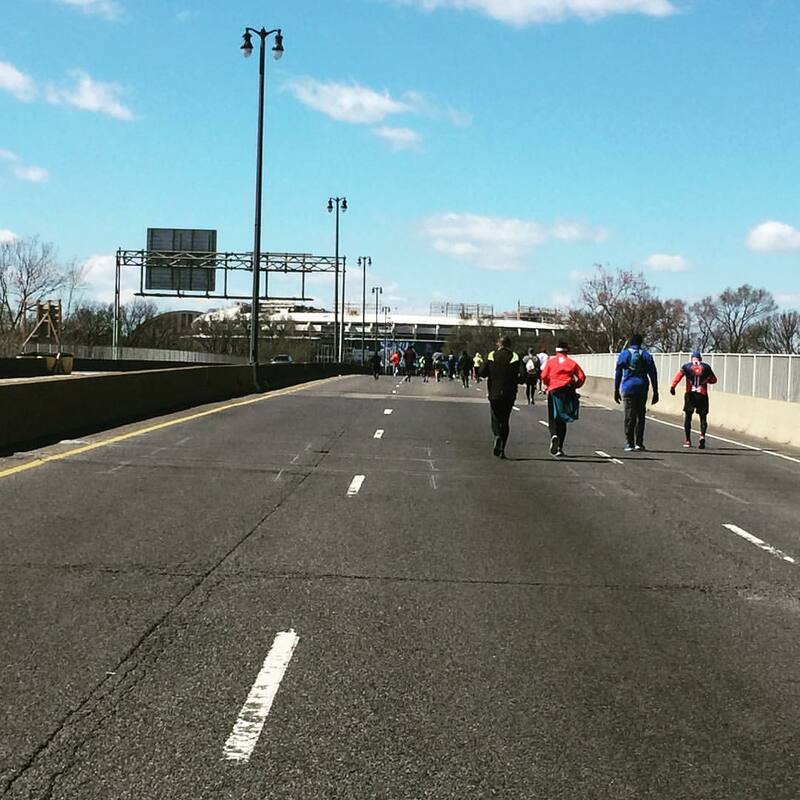 Another difference with this year's course was the right turn we made, taking us on an half mile long out and back on I-55/Potomac Freeway, completely closed this morning for us runners! This part of the course took us on an underpass underneath Juarez Circle at the edge of GWU's campus and the intersection of New Hampshire and Virginia Avenues and 25th Street NW. I swear, we're all running up the hill! 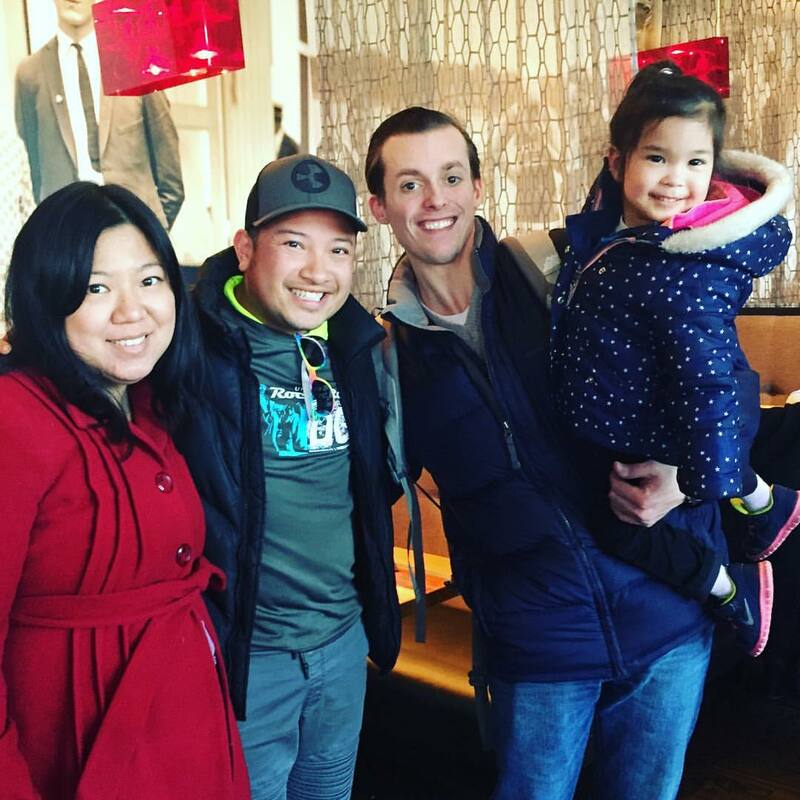 All four of us caught up to each other on the Inspiration Mile. 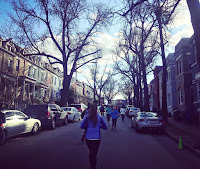 Taking on a variation of a 4 minute run/1 minute walk interval, sometimes running a bit more, sometimes running a bit less, when water stops came along, Hollie and I continued on as we ran along the northern edge of the neighborhood of Adams Morgan, a culturally diverse neighborhood also considered the center of Washington DC's immigrant Hispanic community, but also a thriving spot for DC night life, with a number of bars and clubs along its main strips. 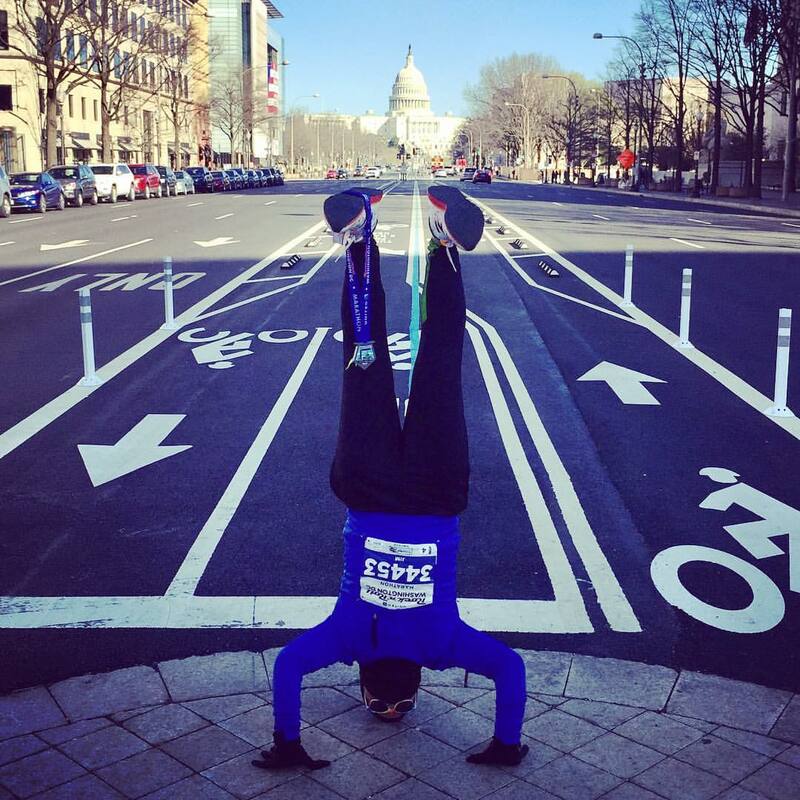 In 2014, the American Planning Association even named it one the nation's "great neighborhoods," citing its intact Victorian rowhouses, murals, international diversity, and pedestrian- and cyclist-friendly streetscape. 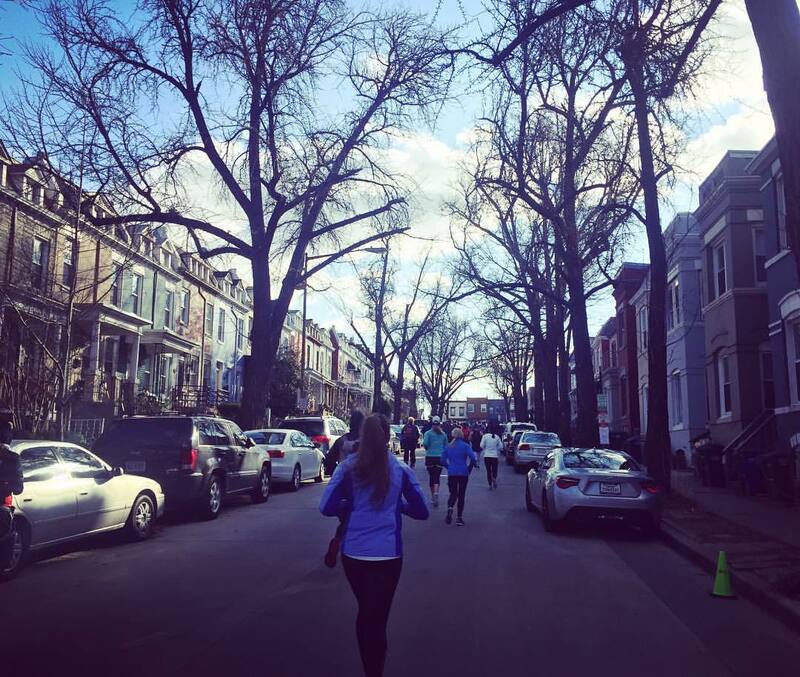 We ran along Columbia Road NW onto Harvard Street NW, heading eastward into Columbia Heights, another diverse neighborhood. Just after mile 8, we came upon Howard University. 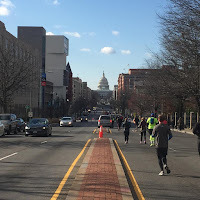 We ran alongside the McMillan Reservoir before turning left onto Bryant Street NW, and then turning right again onto relatively flat Capitol Street NW, the demarcation line between DC's east and west streets, where we had an unfettered view of the Capitol Building some two miles away. 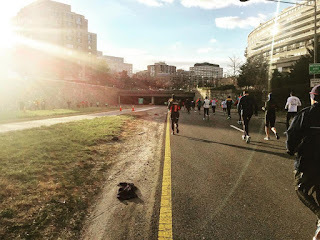 We had some nice downhill underpass sections, as well, but eventually, we turned left onto K Street NE and headed eastward into the area north and east of Union Station, a neighborhood nicknamed "NoMa" for being "North of Massachusetts Avenue." We eventually found ourselves on the vibrant and artistically dynamic H Street Corridor, before we turned right onto 13th Street, heading south toward Lincoln Park. We skirted around Lincoln Park, a beautiful greenspace framing our views of the Capitol much closer than when we were up near Howard. We then found ourselves in the middle of tony Capitol Hill (and the halfway point of the race), heading westward on East Capitol Street NE, DC's main street separating the north and south sides of the city, with the Capitol as the quadrant separator. 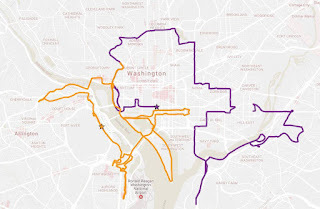 Just before getting right up to the Capitol, we turned left and headed southward along 3rd Street SE, and continued downward through Capitol Hill to E Street NE, and then further south along South Capitol Street SW and past Nationals Stadium. Hollie and I crossed the bridge over the Anacostia River gingerly, as there were sections with open grates. 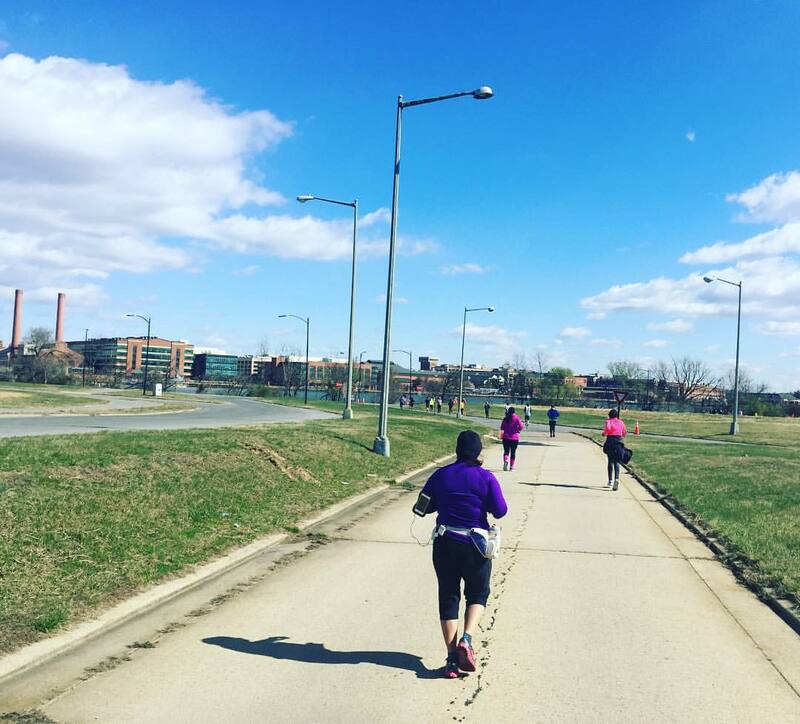 We waited til the roadway turned solid again, and then took on the downhill strong, as we made our way onto the southern bank of the Anacostia for the 1.5 mile long out-and-back along South Capitol Street SE. This section of the race was pretty windy, but we also had to deal with some of the least pretty views of the entire race. To our west was Joint Base Anacostia-Bolling undergoing quite a bit of construction; to our east, the Anacostia Freeway, aka I-295. While it was an uneventful out-and-back, we did get the opportunity to see some of our friends also taking on the full, including Almi, Fred, Seth, Mitch, Donna and Sherry. On the back portion, we made our way back up toward the river, running along Anacostia Riverwalk Trail with views of the Washington Navy Yard across the way. 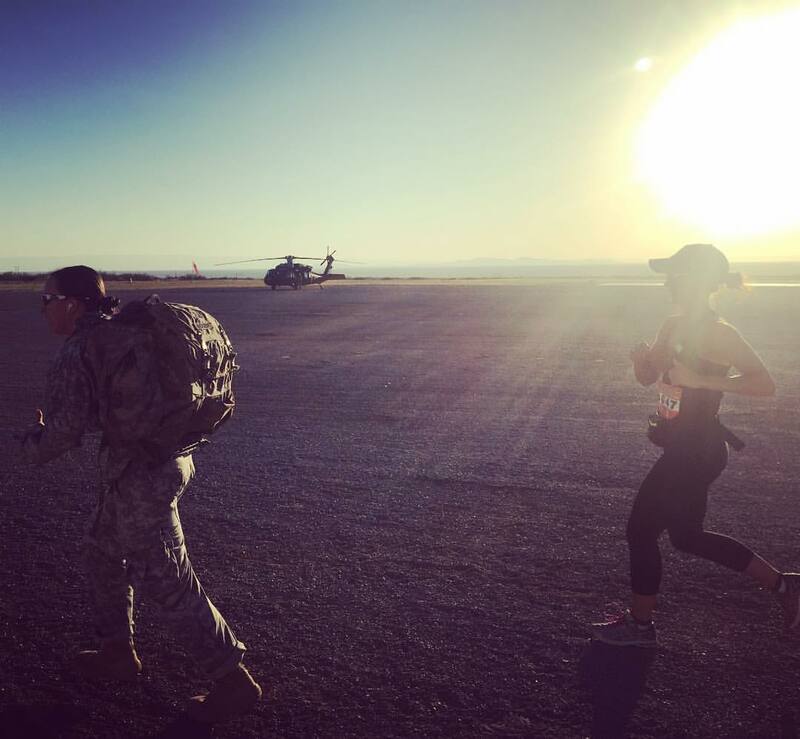 By this time we had reached the mile 19 point of the race, and I was definitely feeling it. 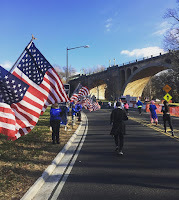 The course crossed underneath the 11th Street Bridge and the John Philip Sousa Bridge before doing a large loop around Anacostia Park, where we felt the wind at its strongest point up to this time. The course then took us underneath the Anacostia Freeway, and on a short out and back along Pennsylvania Avenue SE, before following Fairlawn Avenue SE and taking us through some residential areas before dumping us onto Fort Dupont Park. Fort Dupont Park. Hills hills hills. 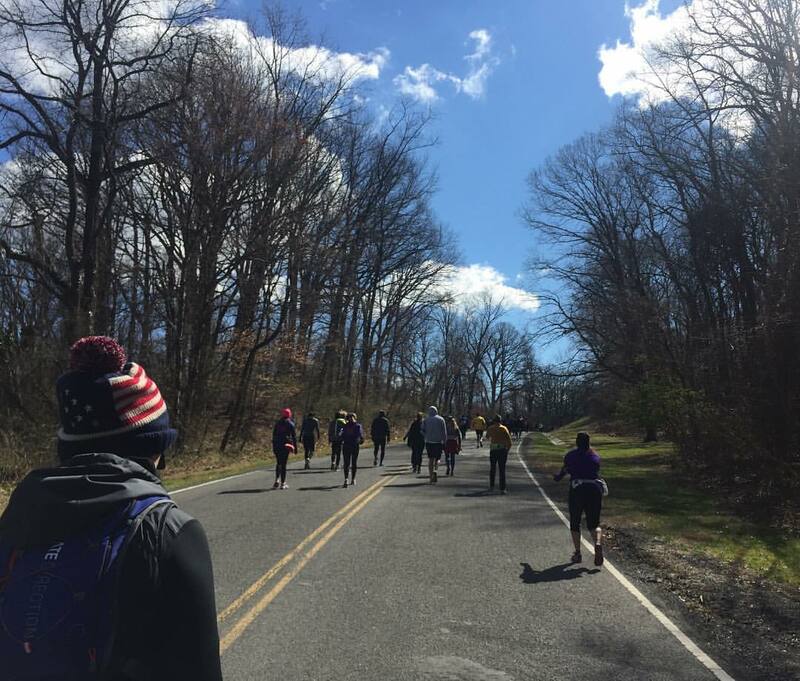 At this point, we had reached about 22 miles into the race, and we encountered some rough rolling hills which slowed me down considerably. Hollie continued on, as did the 5:00 pace group, so I begrudgingly let them go while I went at my own pace to finish out these last four miles as solidly as I could. I was able to let out my last big push on a downhill along Ely Place SE at the north edge of this park and past the mile 24 marker, but this was short-lived, as I encountered another short hill after turning right onto Minnesota Avenue SE, as ran through the neighborhoods of Greenway and Fort Dupont. 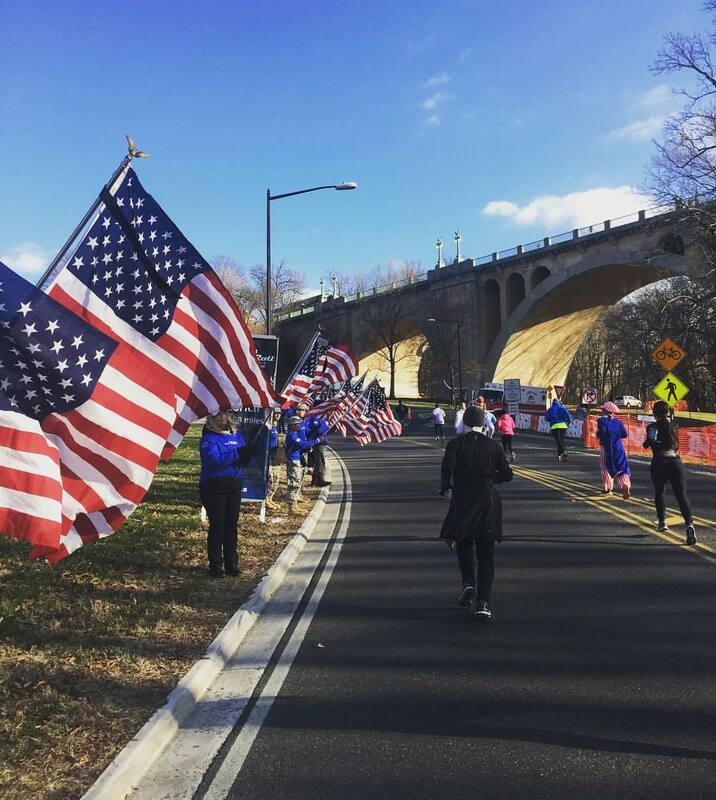 We then took the curved ramp downward onto East Capitol Street SE, where we then went westward back across the Anacostia River and through the absolutely windiest part of the race that we'd experienced (right at the end, of course!) 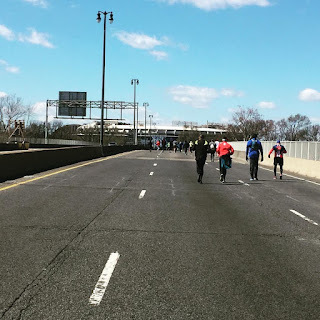 as I trudged my way along to a 5:06:38 finish in the parking lot of RFK Stadium. SOOOO COLD on the highway. RFK Stadium and the finish in the distance. 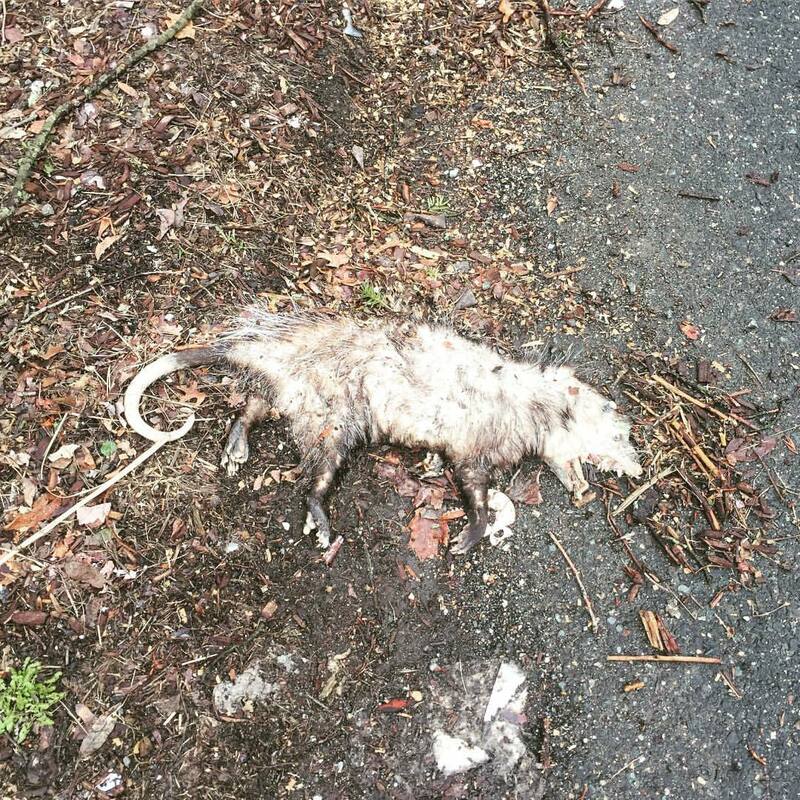 Black Sheep post race... I'm beyond bundled up! Thankfully, there was no precipitation at all during the race, which was a big issue in 2014, as the rain and chilly air caused it to be especially uncomfortable at the finish. Thankfully, I was able to proceed directly to the UPS truck to retrieve my big down coat which I had checked at the start, and layer myself accordingly to keep warm. Hollie had finished only four minutes in front of me, but we managed to be together from miles 6 to 22.5, making this tough race much more bearable, to have a friend along the way for a majority of the time. 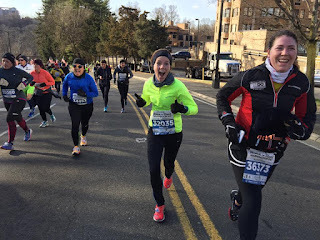 Also, this was the first race that I can say I left my music at home on purpose and went headphoneless for an entire 26.2! 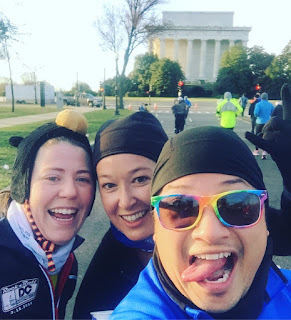 I met up with fellow Black Sheep for some photos before we retrieved our marathon jackets, and then caught up with Donna and Seth, agreeing to meet at the metro station, which was understandably packed from runners finishing up their races. course and the 2017 RnR DC course. I've ran all over this area! My favorite beer! 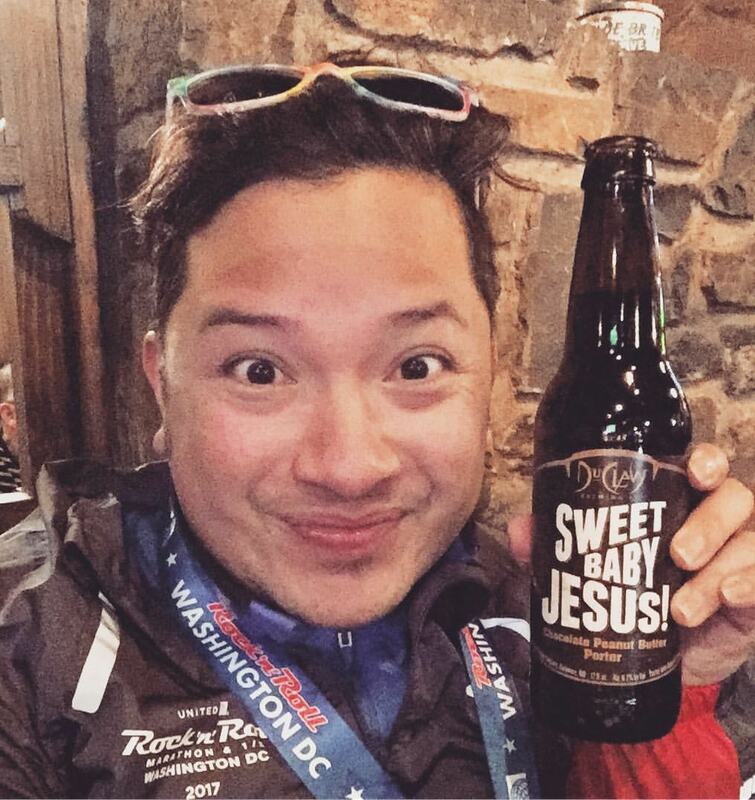 Choco PB Porter! After the race, we headed back downtown to go to FADO, Donna's favorite restaurant/bar in DC, an Irish pub located in Chinatown, for some much needed lunch (and to celebrate the race, which also happened to mark off Donna's 50th lifetime marathon! ), and then I headed back to the garage with Seth to retrieve the car. 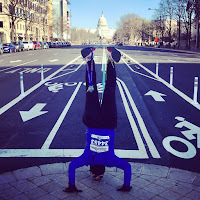 We stopped Donna's luggage off, then found a perfect spot for me to get my headstand photo taken, then headed over to my accommodations for my second night in DC, my friend Baylee's in the DuPont Circle neighborhood. She was out of town, but we arranged for a way for me to get into her place for the night. 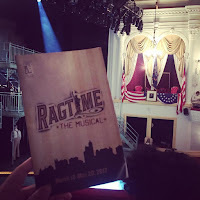 After a shower and a quick nap, I was off to take in some culture, and headed over to the Historic Ford's Theatre to catch the second preview performance of Ragtime, which my friend and fellow Broadway Barkada member Justine was performing a featured role in. Seeing Ragtime at the Ford's Theatre! The show itself was quite good. Based on the novel by E. L. Doctorow, Ragtime tells the story of three groups in the United States in the early 20th century: African Americans, represented by Coalhouse Walker Jr., a Harlem musician; upper-class suburbanites, represented by Mother, the matriarch of a white upper-class family in New Rochelle, New York; and Eastern European immigrants, represented by Tateh, a Jewish immigrant from Latvia. To have this production play in the Ford's Theatre in the country's capital was so poignant, and to have it playing at this point time in history made it incredibly emotional and ironically fitting to parallel current events. After the wonderful show, I met up for dinner with Justine and some of her cast members at Pi (π) for yummy deep dish pizza! Still tired from the marathon, I headed straight back to Baylee's to crash for the night. 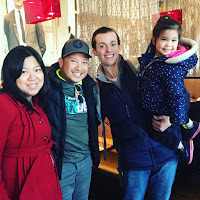 I woke up late next morning, meeting up for brunch at a local favorite, Founding Farmers, with my college friends Sunny and Drew from Chicago. They were in town for Sunny's linguistics conference at Georgetown, and brought their daughter Raela with them, which was the first time I had seen Raela since not long after she was born... she was growing up into a bubbly and vivacious little girl! 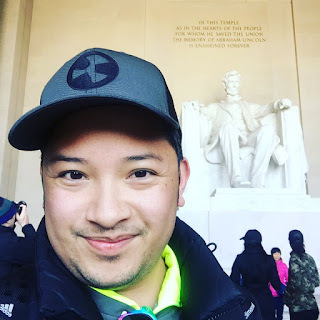 With the remainder of my afternoon open, I walked over to the National Mall, to take in the sights at Lincoln Memorial, the Reflecting Pool, the National World War II Memorial, and Washington Monument, all places I've seen before, but places that I always love to return to when I come to Nation's Capital. It was especially important I went to see the National World War II Memorial, because the following week, I was heading to New Mexico to run the Bataan Memorial Death March, a 26.2 mile/marathon distance march through the New Mexico high desert, in memory of those who perished in the Bataan Death March 75 years ago, and in honor of Filipino and Filipino-American veterans who fought in World War II. I thought it would be quite appropriate to pay homage here as well. With all my "tourist time" behind me, I boarded the metro to head back to Reagan National Airport for my flight home... on first class, nonetheless! Honest Abe... it's nice to see you again. in particular the Filipino and Filipino-American vets.